Here's something I have been working on for a while, and I will add to it as more information emerges. 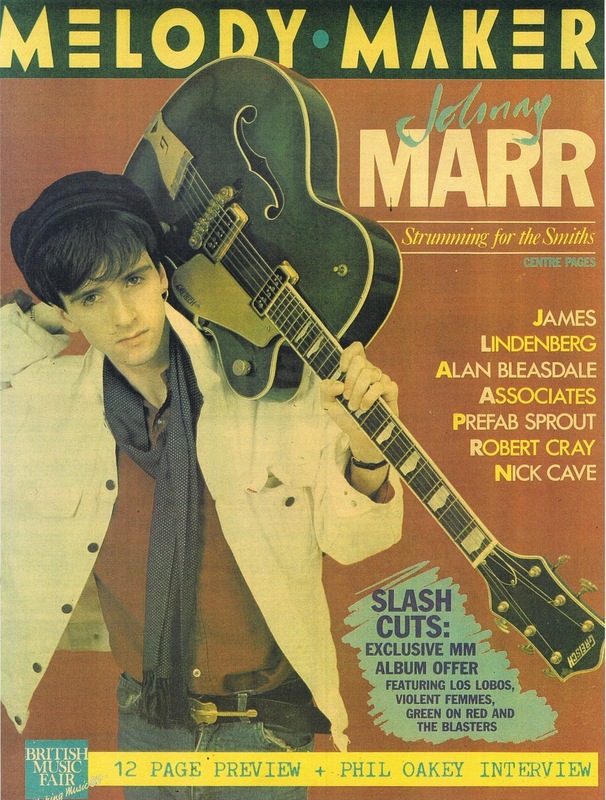 All text in italics below are quotes from Johnny Marr. Some of the guitar photos below and accompanying quotes are from the amazing Guitarchestra page at Johnny's website johnny-marr.com. 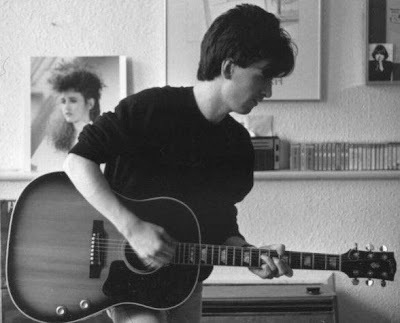 These are The Smiths guitars: Rickenbacker 330, Rickenbacker 360 12 String, Gibson 355, Gretch 6120, Gibson Les Paul Standard, Fender Telecaster, Custom Green Telecaster, 1963 L-Series Fender Strat, Gibson 330 12 String, Martin D-28 Acoustic, Martin D-28 12 String Acoustic. 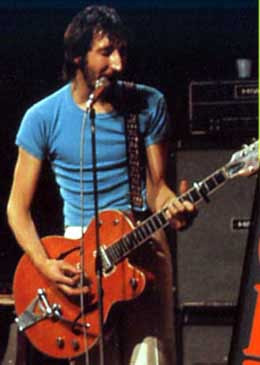 My other favorite guitars are a red '59 Gibson ES-355, a '59 sunburst Les Paul, a custom green quilted-maple telecaster, and three Rickenbackers -- my first 330, an amazing '66 wood-grain 330, and a 12-string that used to belong to Pete Townshend. I bought a few '63 Strats from John Entwistle. 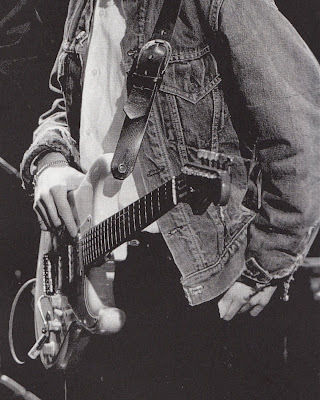 And then there's a '69 Strat I bought from Jeff Beck. I use Ernie Ball strings, gauged .010 to .046, on most of my guitars. 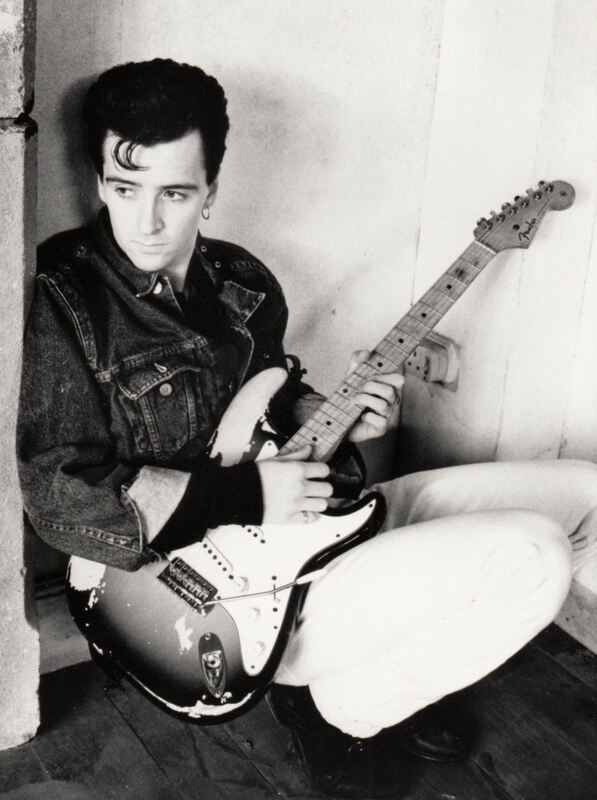 I always used a few different guitars in the studio some of which I still use now. 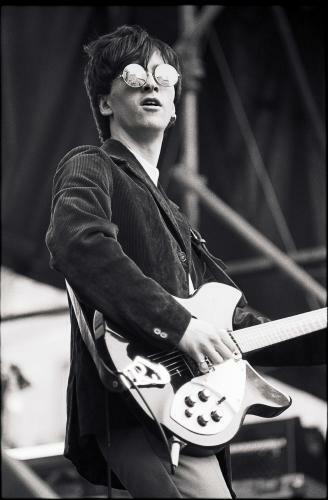 I did use the Rickenbacker a lot, particularly on the first album and 'The Queen Is Dead' as well as the early singles/b-sides. 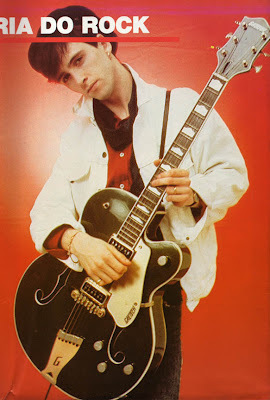 The '54 Telecaster was also used a lot, it's the main riff on 'This Charming Man'. A lot of 'The Smiths' was actually recorded with a '54 Telecaster belonging to John Porter. 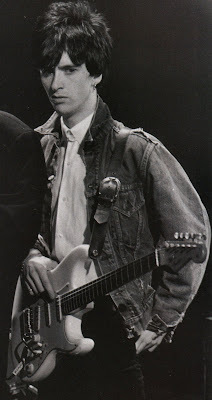 I used a Rickenbacker 360 12-string as well, and that was the guitar which subsequently got all the attention, but in fact it was mainly the Tele, and a bit of Les Paul. 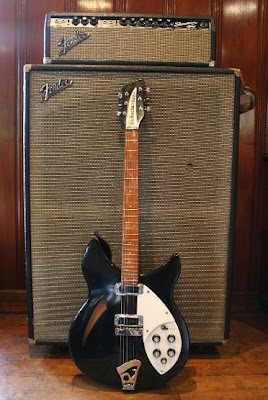 With my amp set up, the Rickenbacker's just perfect as it goes through a Fender twin and a JC120. The Fender twin has got loads of power and that handles the bottom to mid range. The Fender has also got the best reverb, so I just let the Roland handle the top end most of the time; it's a dream and sounds great. It's something that I wanted to get together for a long time. 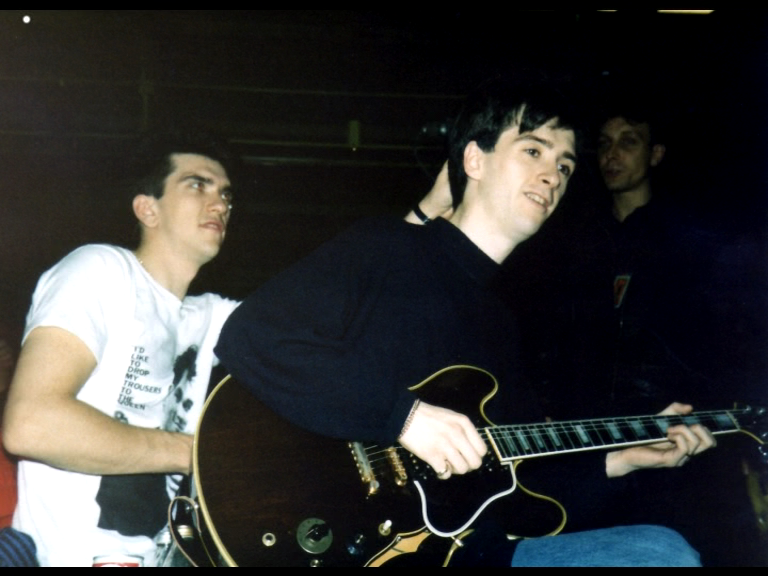 On the first long British tour I used either one or the other depending on what sounded good in the sound check. 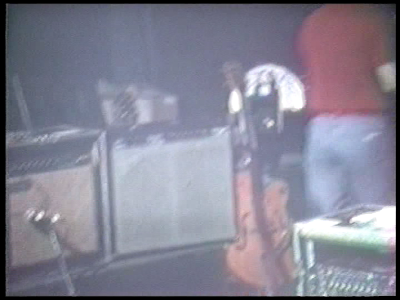 When I listen to some of the live tapes now I think they could have been so much better if I'd just used a Fender twin. If I had the choice between one or the other I'd think I'd use the Fender twin with a really good Roland chorus pedal. I also used a Fender Pro a lot - that was also on a lot of the early Smiths records, while my Blackface Twin was used from the Queen Is Dead onwards. Overall, what I really didn't like about the records then was the amp, the Roland Jazz Chorus. Yamaha JX50 in front of Silverface Fender Twin. Live in Barcelona, 1985. Fender Silverface Twin Reverb and JC-120. Note Boss CE-2 on top of Twin. March 1st, 1985. Ibanez CS-505 Chorus on top of Vox AC30. 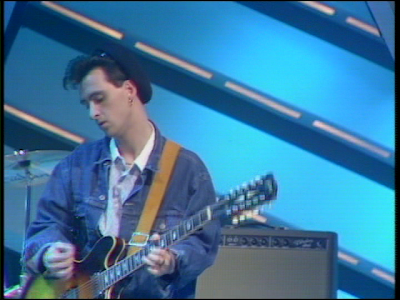 Live on the Whistle Test, May 20 1986. 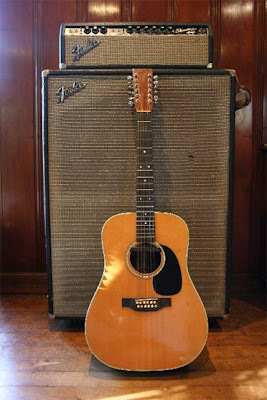 Fender Bandmaster, Roland JC-120 and Mesa Boogie Mk III. Fender Brownface Concert in Craig Gannon's Whistle Test backline. Silverface Twin Reverb to the right. Live on EuroTube, July 5 1986. 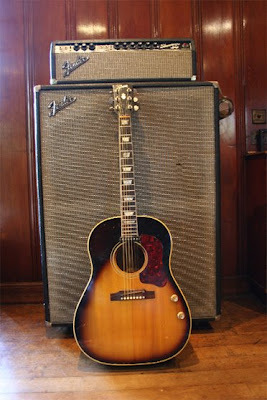 Roland JC-120 and Fender Bandmaster. 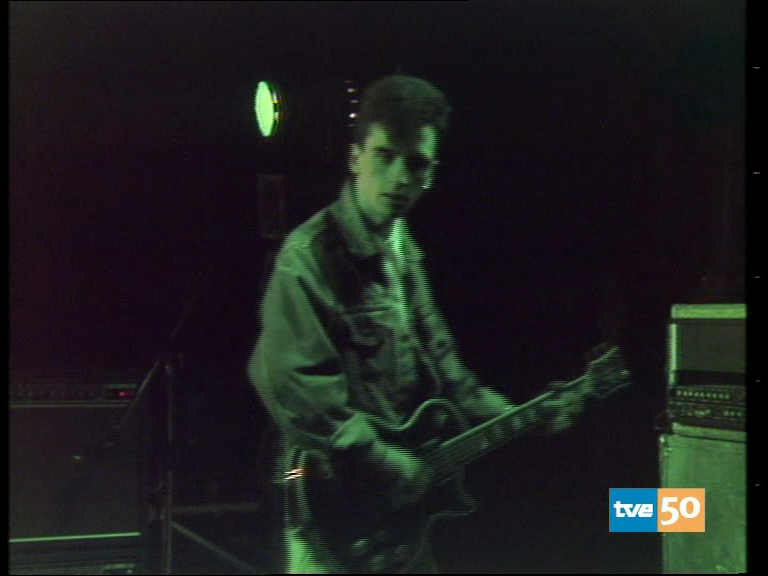 Live, 1986. 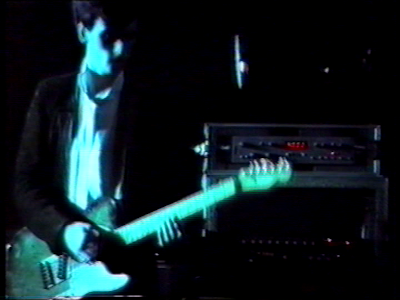 Roland JC-120, Mesa Boogie MkIII and MkI. 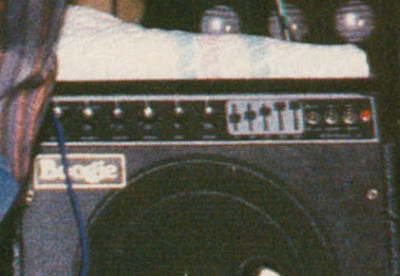 Detail of EQ settings on the Boogie MkIII. [The JC-120] has a really good chorus and I'm never without it really. 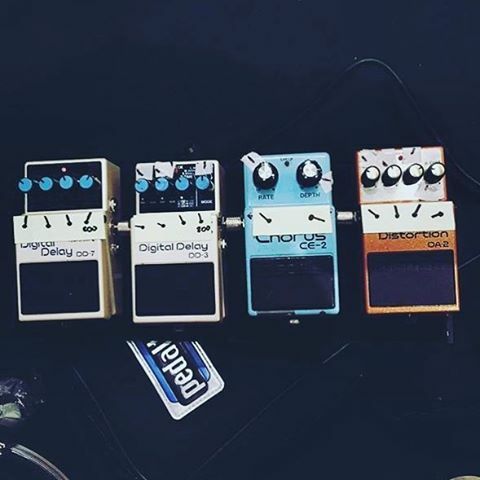 I used to use a couple of chorus pedals. 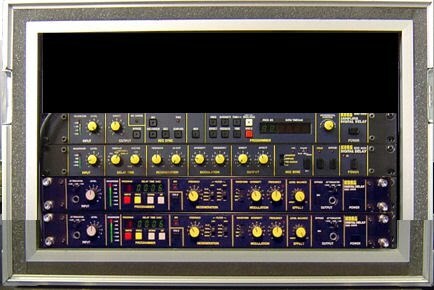 In the studio I was using one of the old Roland stereo-split choruses and it just happened that it had a great vibrato. It's one of those which has got vibratio on one button and chorus on the other and I use those effects on nearly all the sessions. 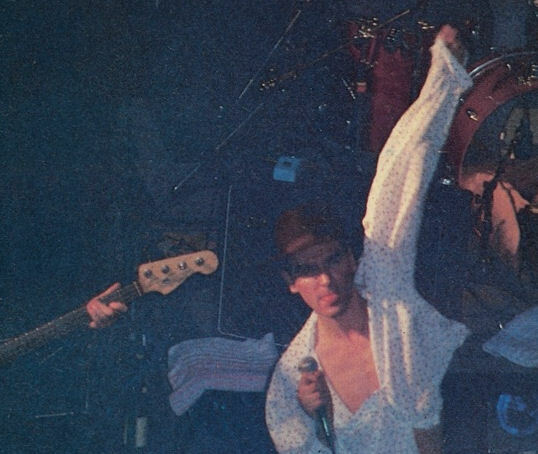 At Dingwalls, August 30, 1983. Rickenbacker 330, Fender Twin Reverb, and Boss CE-2 visible. 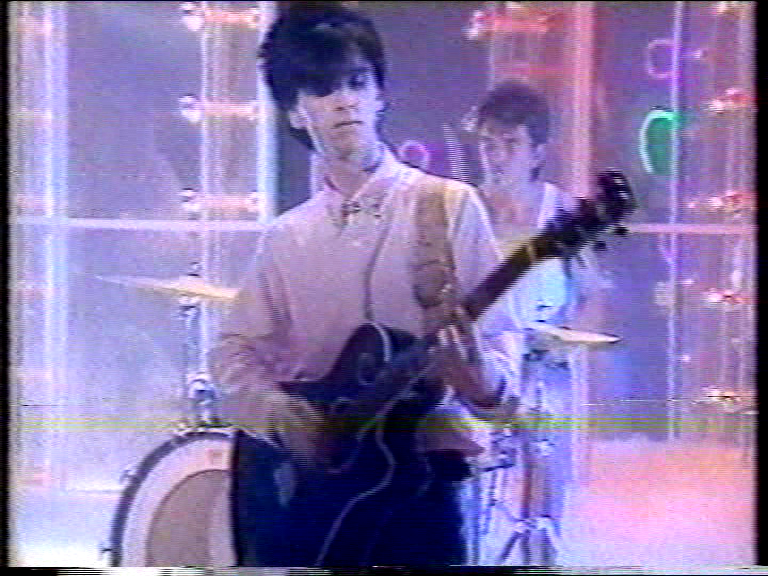 Performing on The Tube in 1984. 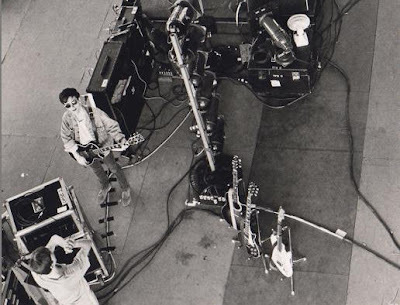 On top of his Twin Reverb is a Boss CE-2 and a Boss GE-6. 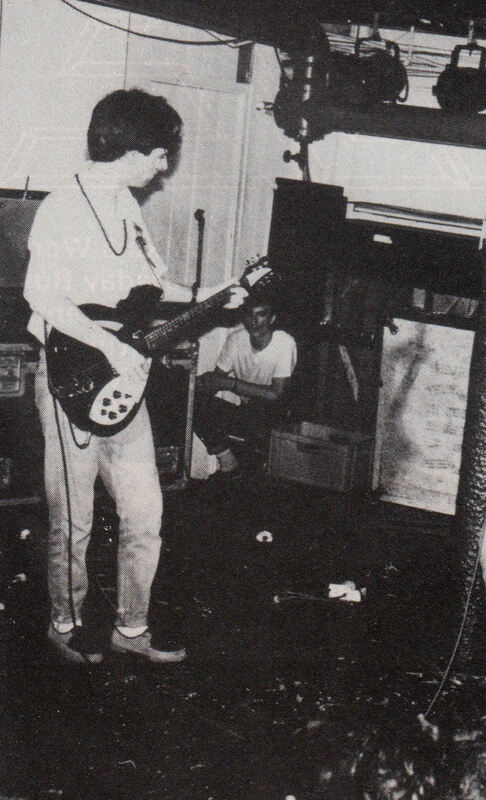 Note the "Glad Hips Music Ltd." stencil on the amp case. Live on Whistle Test, 1986. 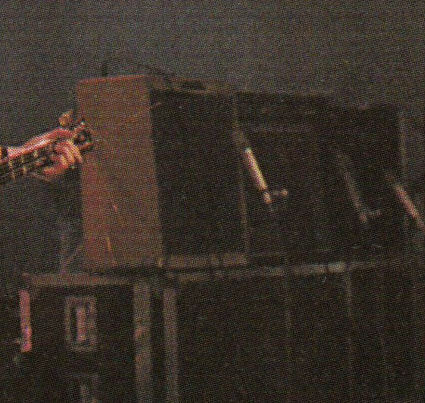 Boss OD-2 visible on stage. 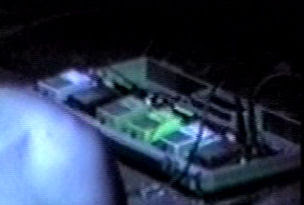 Rare shot of Johnny's pedalboard from the '86 Nottingham gig. The pedal case is a Boss BCB-6. From right to left is a PSM-5 followed by a GE-6, OD-2, TW-1, HM-2 and the CE-2 on the end. Below is a mock-up of the pedalboard. I went back to some of my old stomp boxes that I had when I was in The Smiths, most of which were Boss. I used to love the white GE-6 equalizer, and the very first light-blue CE-2 chorus that still sounds really good. 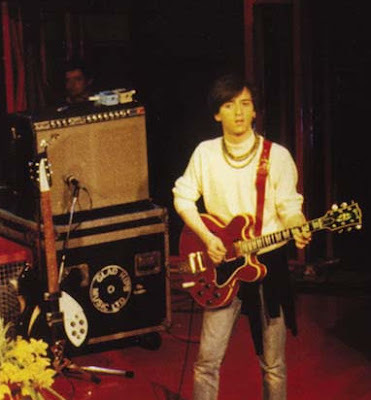 I had the yellow [BOSS] OS-2 overdrive/distortion pedal, the OD-2 Overdrive pedal; actually thats where I got the riff to The Smiths song 'London'. I had the CE-2 chorus pedal, the white GE-6 EQ, the BF-2 purple flanger and when the very first grey reverb pedal came out, the RV-2, I got that. I still own it. It sounds really good. Detail of Boss pedalboard from 2016 book tour showing CE-2 settings. 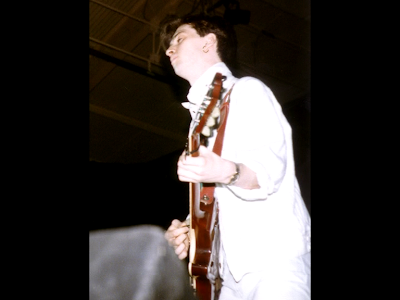 Laguna Hills, California, June 29, 1985. Bel BD40 delay unit on top. Glasgow, September 25 1985. Bel BD40 visible. 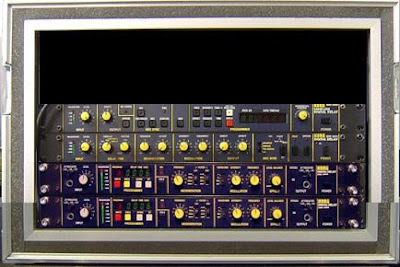 Illustration of 1986-era rack effects. July 5th, 1986: Johnny's rack for Euro Tube contained a Yamaha GC2020B on top with a Yamaha SPX90 below it. 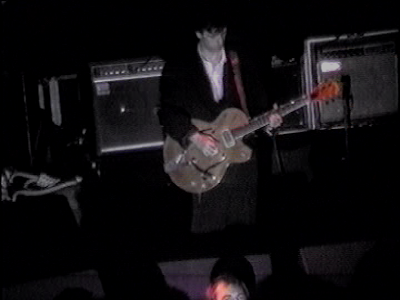 Also note the Boss OD-2 onstage. I've actually started using a digital delay line, just because for one song in particular I needed to use it. I just sent the effect straight through the Fender twin. 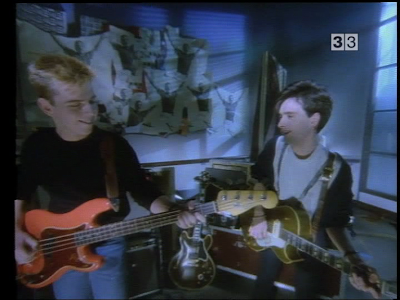 The song is the 'B' side of the twelve-inch 'William, It Was Really Nothing' and it's called 'How Soon Is Now?' which is a 'Bo Diddley' thing, so I had to have the vibrato. 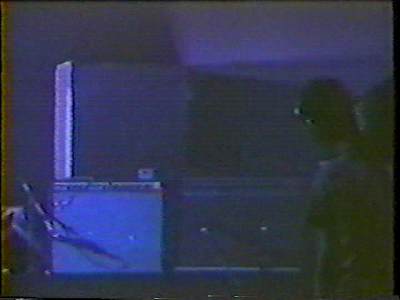 I sent all the signal through the Fender twin and just put straight guitar through the Roland. I just stuck a slide on and it worked. I was a little bit worried because it was difficult to play. For the first time I'd done something really tricky in the studio which I had to reproduce live. We've done lots of things which I'd never be able to reproduce live just because there are more important things going on. The songs have never suffered because I normally tend to play them the way they're written live and if an overdub turns out to be an essential part of the song maybe I'll switch to that. 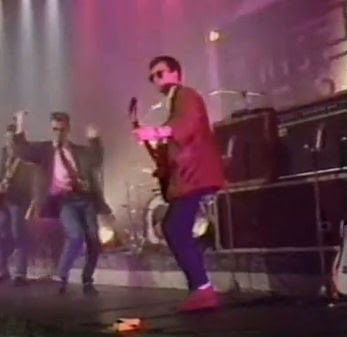 'How Soon Is Now?' 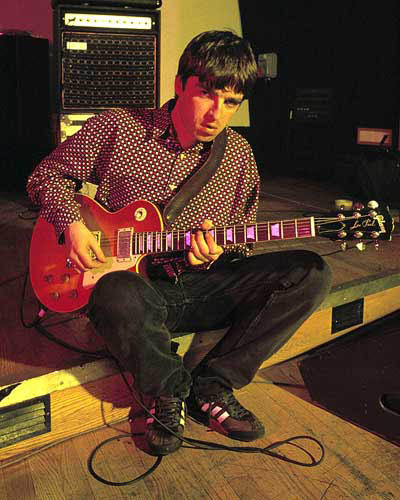 is quite a difficult one as there are two completely separate guitar parts that can't be played at the same time. What I do is change to a guitar which has the bottom four strings tuned conventionally, but the E string is tuned a third above the B. I play into the digital delay and put it on hold to play over it. I just take the hold off when we get to the other chorus bits and I can play that with the bottom four strings and then the hold goes back on. I had to send the signal through the Fender twin because of the vibrato. The only difficulty with using vibrato all the way through a song is that you've got to really get it in time and Mike the drummer has got to ride the beat. I was really panicking before the gigs but it turned out OK. It doesn't sound exactly the same live as on the record but it is still as powerful and still as atmospheric so I'm happy with it. Johnny first mentioned his delay the above quoted excerpt from a Feburary 1985 Guitarist article. 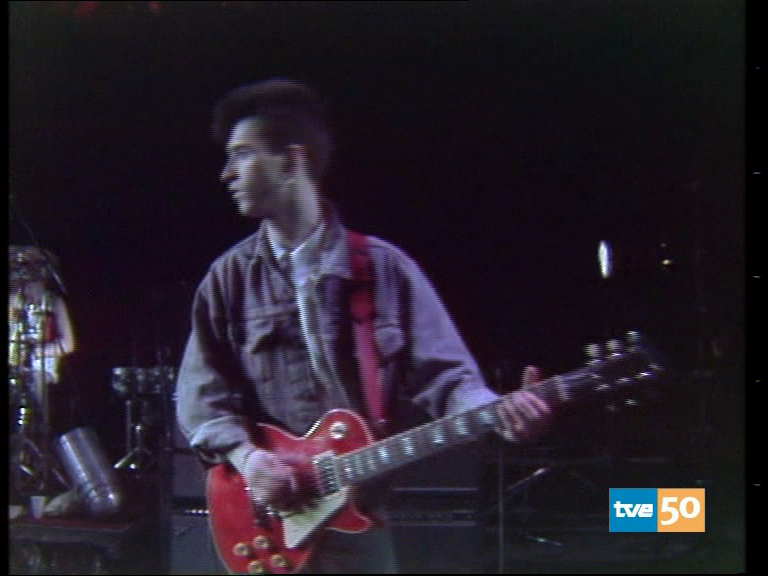 The first delays seen in recorded shows are the Korg SDD 1000 and 3000 seen at the Spanish shows on the European dates supporting Meat Is Murder in May of 1985. 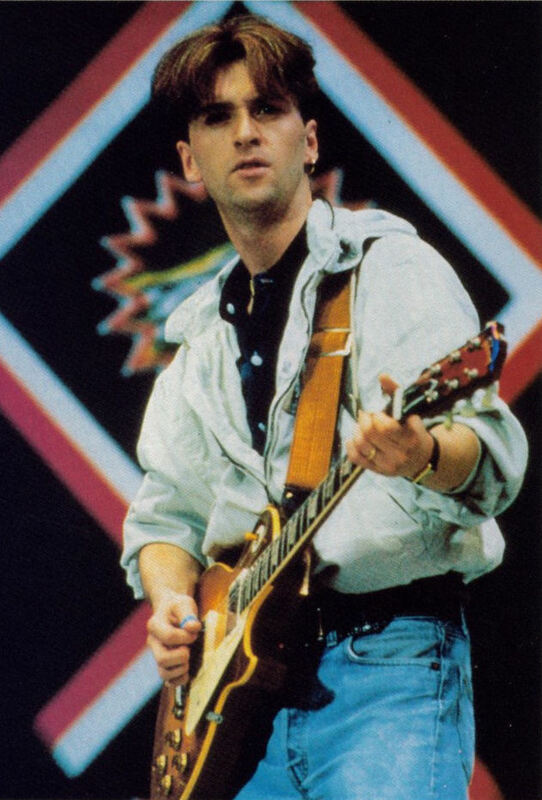 By the June dates in the USA, he has added a Bel BD40 delay, which he was still using on the September 1985 Scottish tour. 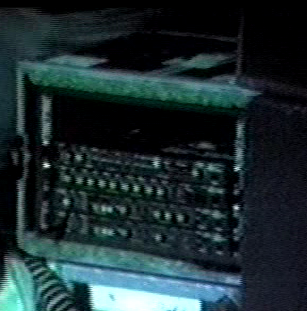 By 1986, the Bel is gone, and his 1986 era rack is in place: 2 Korg SDD3000's, a 1000 and a 2000. While some of the units were clearly used to play the slide sample during How Soon Is Now?, they were also used other times. 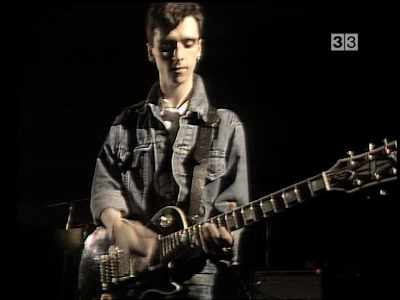 A notable example is the July 20th, 1986 show in Salford in which Johnny uses a delay unit to harmonize the outro solo to Never Had No One Ever. But honestly that jangly sound wasn't premeditated. 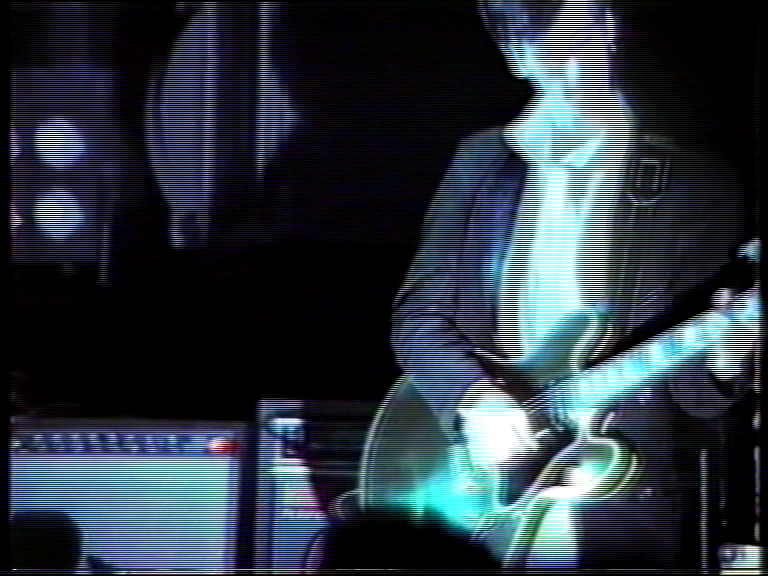 I mean I wasn't going for a deliberate neo-psychedelic sound or anything. I was literally setting up my amp and I thought 'Oh, that sounds too bassy' so I'd give it a little bit more on the chorus pedal and then that wasn't right, so I gave it some reverb and then some presence. It came about because anything else didn't sound right. Foremost the sound has to be melodic. Guitars can be powerful and guitars can be rhythmical but within the structure we've got and because of the songs we write that's what is needed. I find that I approach [wah wah's] like a tone pot. Now, I find myself keeping my foot on it all the time, just letting it out slowly without thinking about it too much. Also, you can leave it on, opened slightly without even touching it -- that gives you a completely different tonal range. 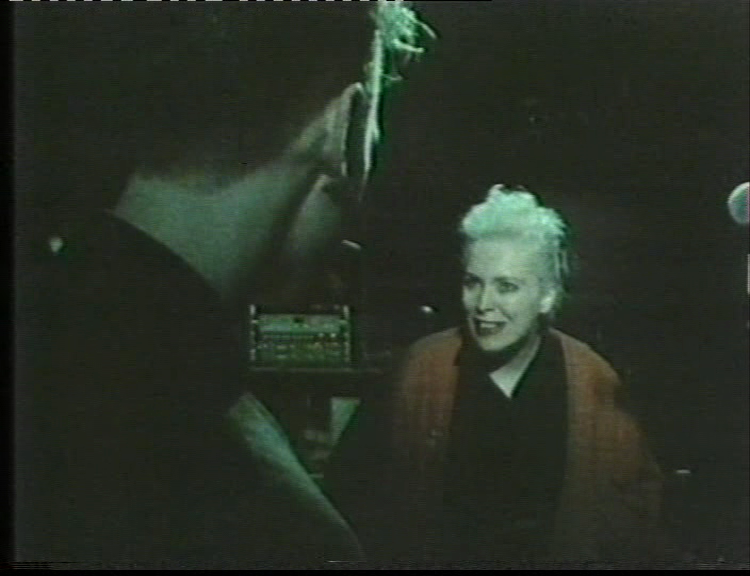 The "Shoplifters" break was the first time that I really discovered that. And if the filter is open in just the right place, you can get a harmonic to sing like a bird. 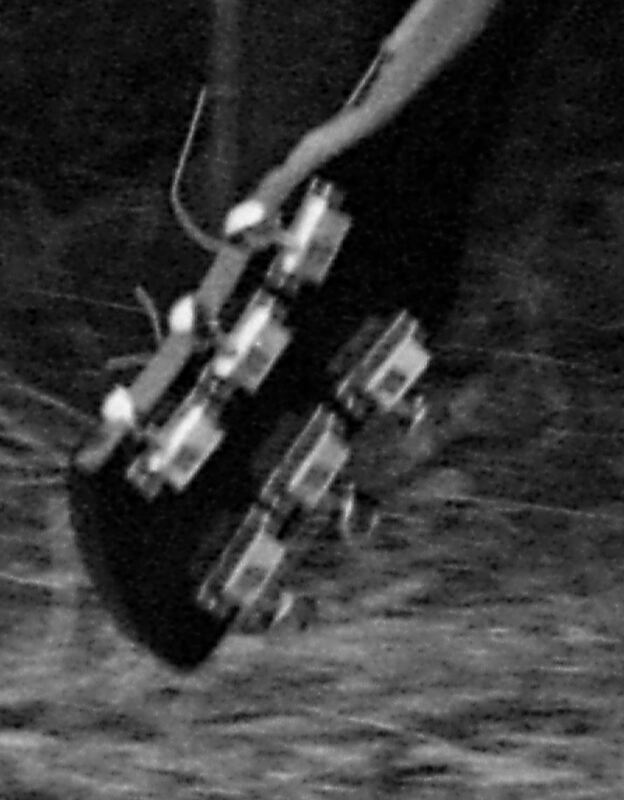 Johnny's slide is chrome and appears to be one of the shorter versions. Johnny's usual capo was a Dunlop like the one seen above. 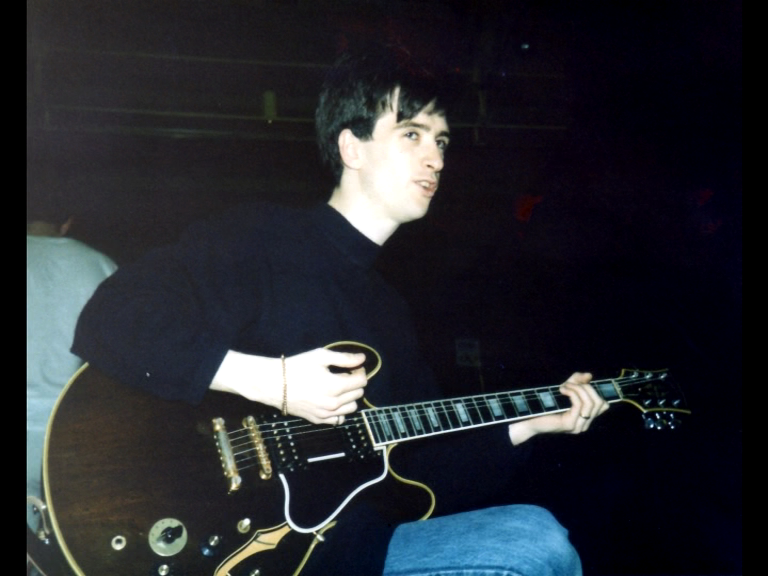 While Johnny used a capo throughout the Smiths, he almost never used one to capo up to F#(except on acoustics, which were always capoed to F#). 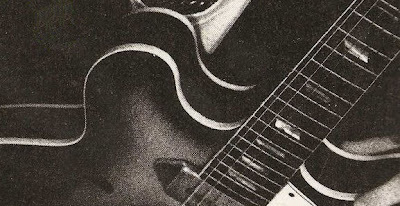 Usually electric guitars were tuned to either standard tuning or tuned up to F#. Capos were used on songs such as Bigmouth Strikes Again, There Is A Light That Never Goes Out and Frankly Mr. Shankly(all three capoed at the 4th fret on a standard tuned guitar). Other songs mixed tunings, such as Never Had No One Ever, which had Craig Gannon playing a standard tuned guitar with a capo on the 5th fret and Johnny playing in standard tuning. I do remember when I got my first one. It was a black and creme one, it went everywhere with me. I put everything I had into getting that guitar. 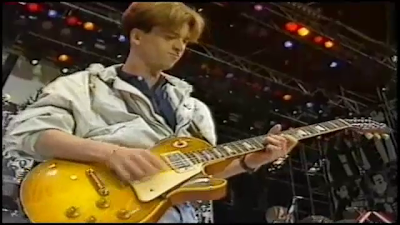 It was actually my first real, decent electric guitar. I learned how to play a lot of stuff on that. 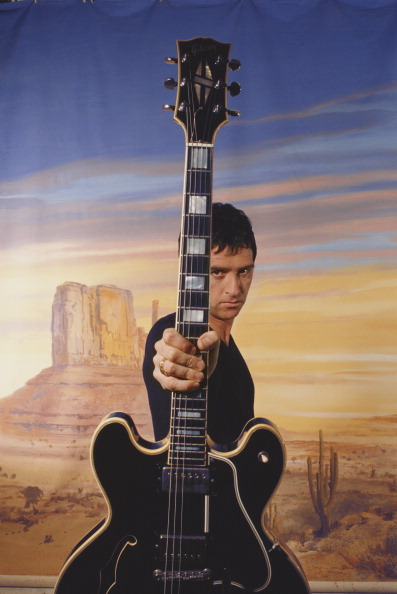 I was a really big fan of Raw Power by Iggy and the Stooges, and I learned to play that record on the black Les Paul. 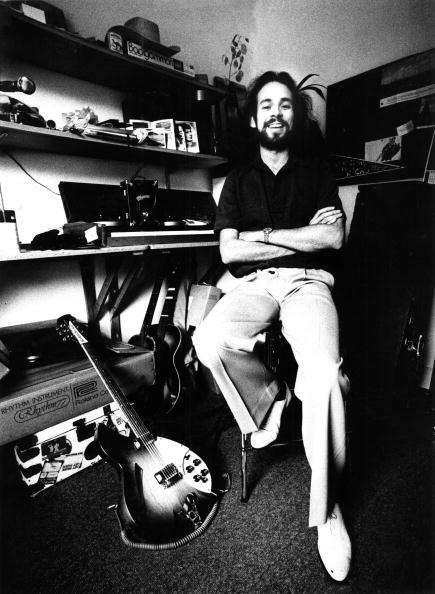 He later traded it in for the Gretsch 7680 and a Teac tape recorder. What Difference Does It Make, Miserable Lie, Handsome Devil demos. Drone Studios Manchester, 1982. 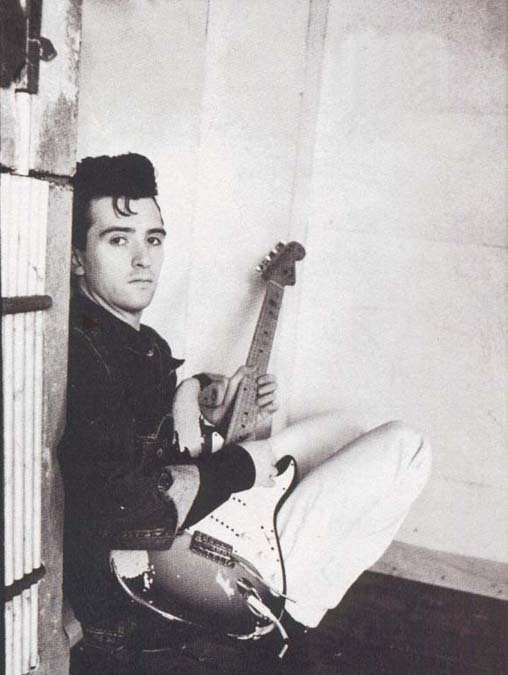 This is the earliest Smiths-era photo of Johnny with a guitar. This is a Gibson 335 in a Walnut finish. 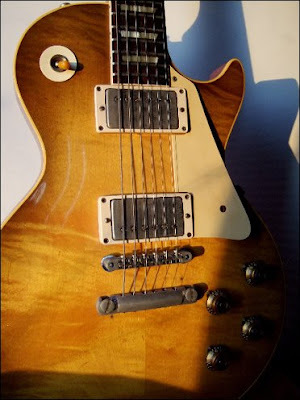 1977 was the only year(at that time) in which they were offered with the coil tap switch on the lower horn. 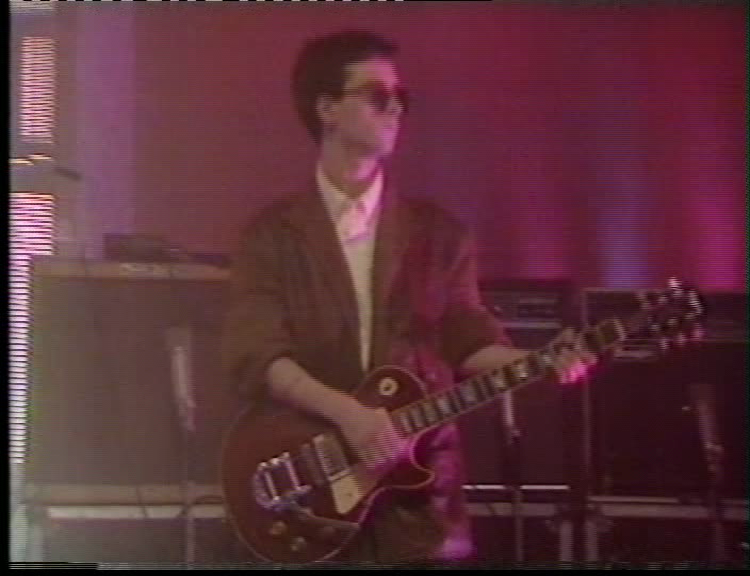 Used on Smiths demos, early gigs, 'Hand In Glove'. I had two Gretsch Super Roc Jets which were really cheap. I've had one for ages and I got a new one a couple of weeks ago. One of them's got a phase unit and compressor built in. 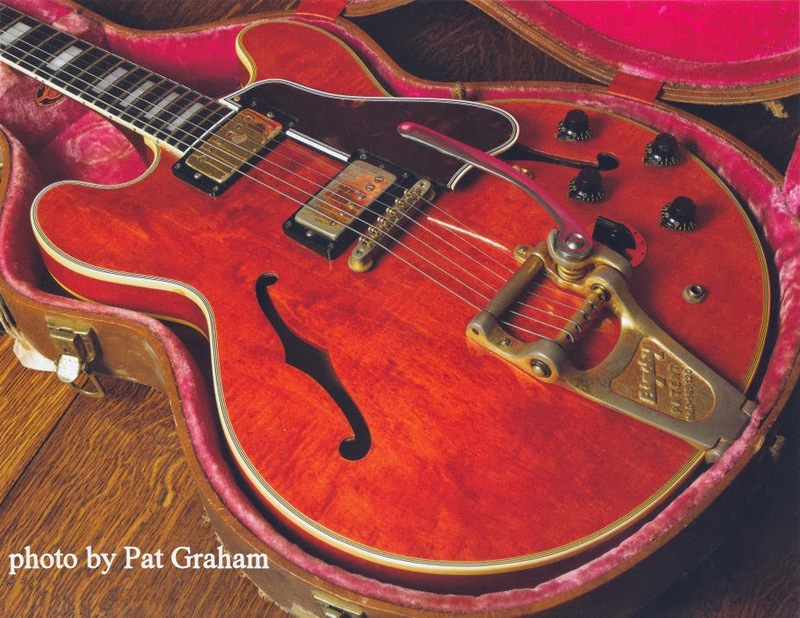 It has a solid body in the old conventional Gretsch shape with one cutaway and it's really thin. I got a new one in a mink colour which hasn't got the effects unit on. They look quite tacky but they're good guitars to play and not that expensive, either. It began as an experiment with Gretsch Roc Jet I was playing at the time. It didn't sound good at concert pitch, so I tuned up a whole step to F#, and the bass player tuned down a step. 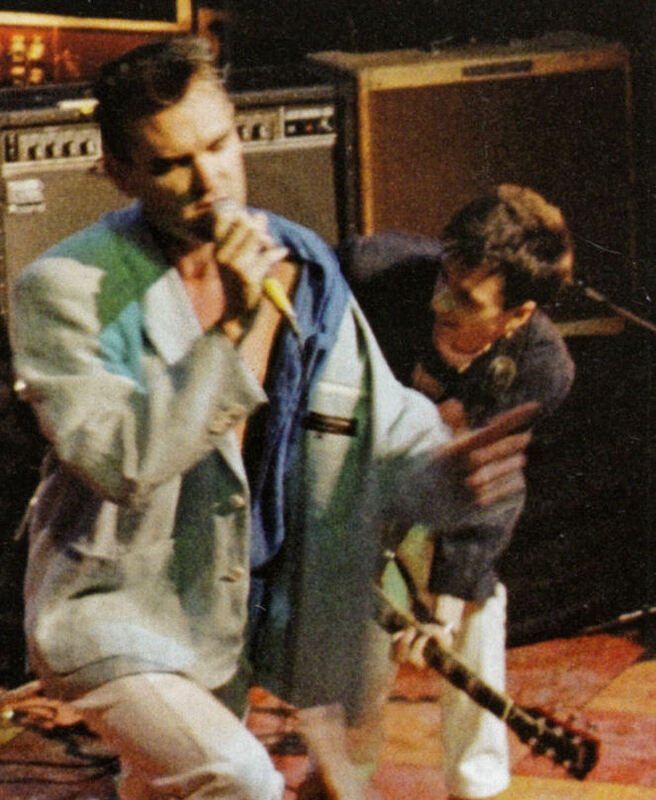 I wrote the band's initial songs like that, and, to an extent, the tuning dictated where Morrissey was coming from on the first album. 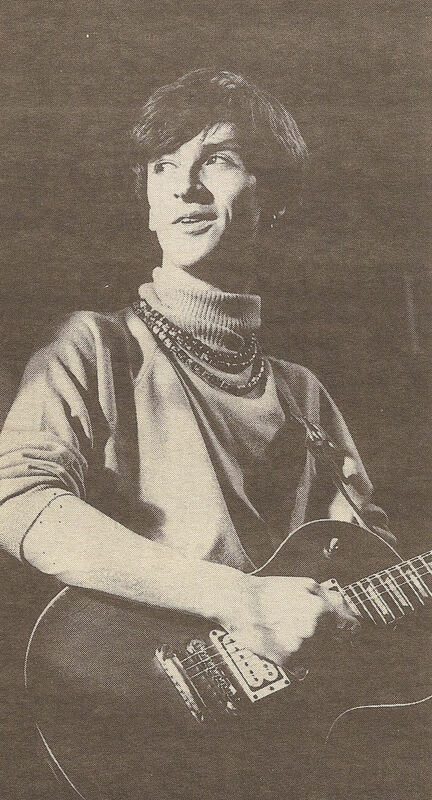 But when we got a record deal I could afford a capo. [The capo] comes from the early days of Morrissey and me writing together. I'd go round to his house, play him a tune, and he'd hum along. I soon realized it made sense for me to tune up a whole tone as he was singing very much baritone at the time. Also, I was writing on my Gretsch Super Axe, which just sounded better tuned up. 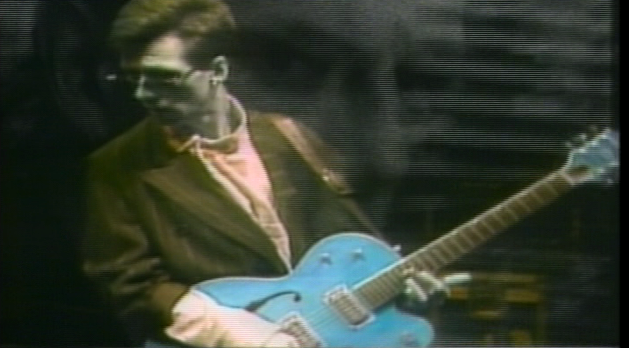 Johnny's second guitar with no effects would have been a 7685 Atkins Axe. There are no known photos of Johnny playing this second guitar. 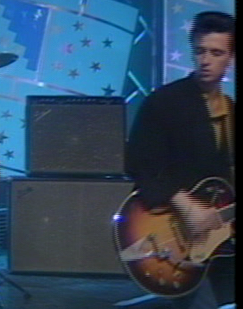 Pete Townshend on TOTP, 1973, moments before smashing his 6120 onstage. 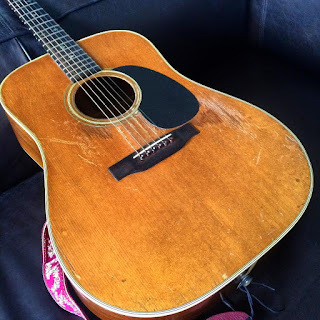 This guitar was supposedly repaired and kept by Pete, which makes the origins of Johnny's own 6120 somewhat of a mystery. Perhaps Pete owned two, one of which was sold. 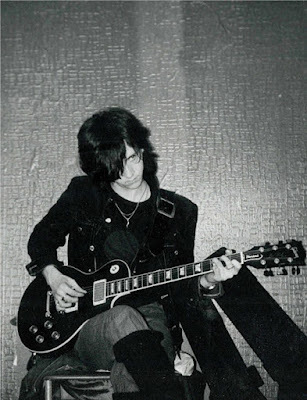 The Gretsch 6120 that I used to write and record "Stretch Out And Wait". You can hear it on "Is It Really So Strange?" too. 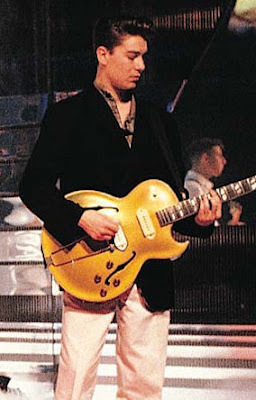 I got it from The Who and It's one of the best old 1960's Gretsch's that I've played. 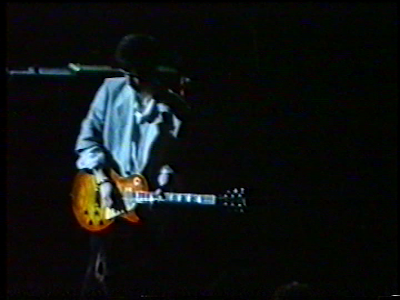 I got introduced to a guy called Alan Rogan who used to work for Townshend, Clapton and Keith Richards. I ended up getting a load of guitars off him. That's where the Gretsch 6120 came in. 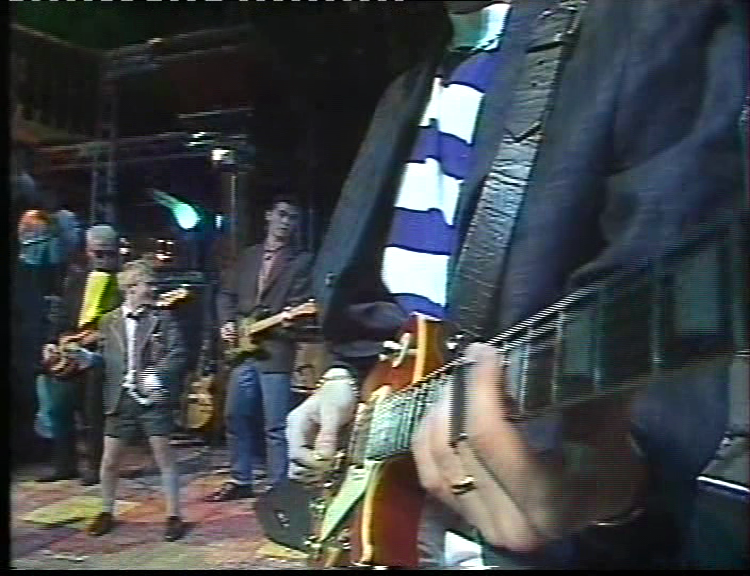 It's the one Townshend played on loads of Who stuff. I don't know why he sold it to a geek like me. This interview and photos were published on August 3rd, 1985. 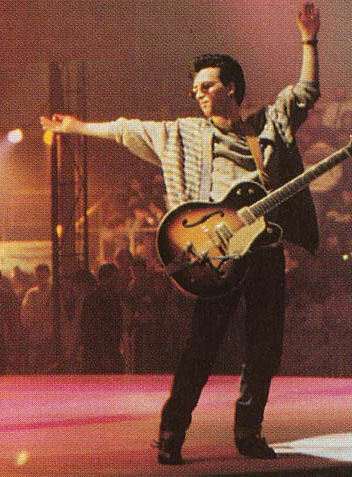 The interview mentions Live Aid, which took place on July 13th 1985, so it must date to late July '85. Johnny has said that this wasn't his own guitar, but a loaner for the photoshoot. 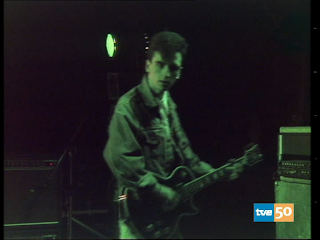 This 6120 can be seen in the Panic promo, which was shot at the soundcheck before the show at Ottawa's Congress Centre on August 2nd, 1986. 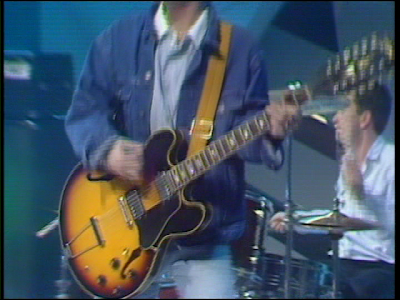 This color is pretty strange, and I'm not sure if the guitar is actually blue or if it is Johnny's orange 6120 with some kind of video effect changing its color. 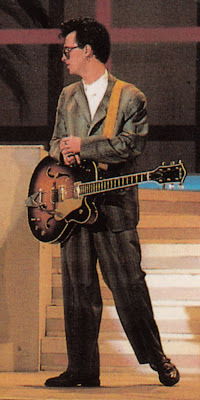 Johnny used this Gretsch for several TV appearances in 1987. It appears to be an early 60's Country Club. 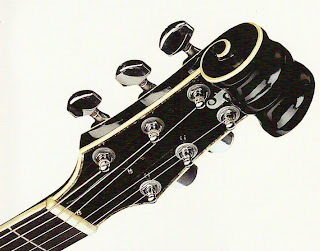 Back of headstock, uncommon Grover tuners visible. Photo courtesy of Paul Norris, used with permission. 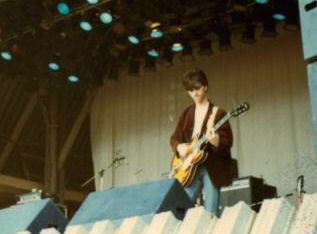 This is my 1983 Black Rickenbacker 330 that I used throughout The Smiths. I got it from A1 Repairs on Oxford Road in Manchester and it was my main guitar at all the early gigs. It's the sound of the riff on 'What Difference Does It Make' and 'Reel Around The Fountain', all of the first album and on other albums too. I still use it now. 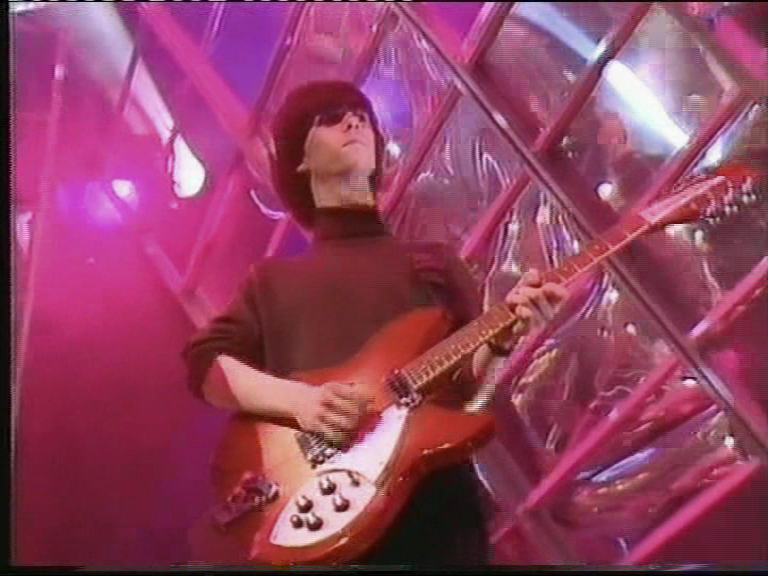 I've got my old faithful which is my Rickenbacker 330; a 6 string. I find that this one is the workhorse, it's the one that I use on most of the numbers live and in rehearsals. 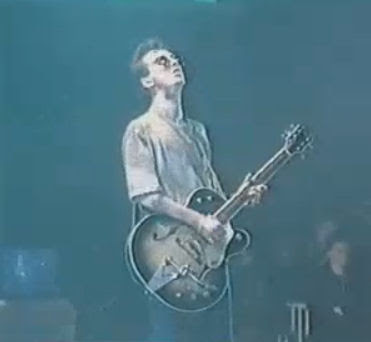 This was a major guitar throughout the Smiths live and recorded history. 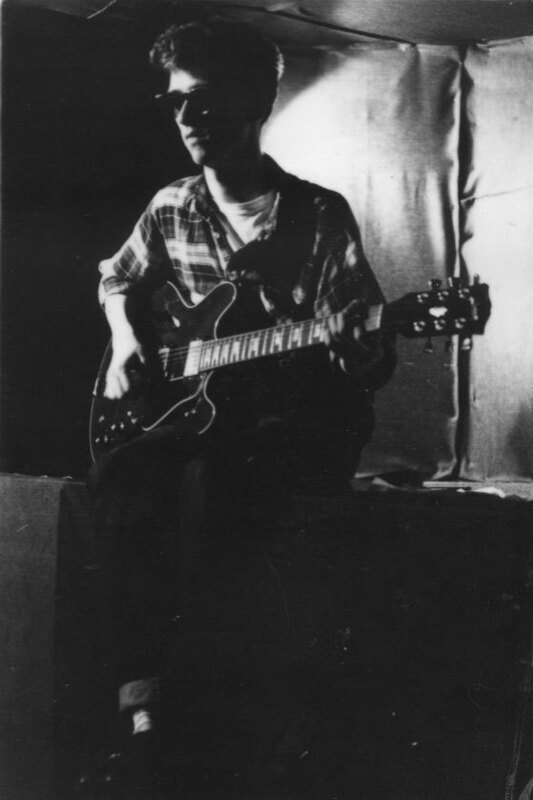 Retired by Johnny sometime in early 1985 for live use, it was later used regularly by Craig Gannon in 1986 as one of his 3 primary live guitars. 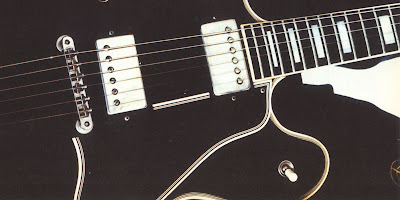 It has "button top" style higain pickups and Grover slimline tuners. 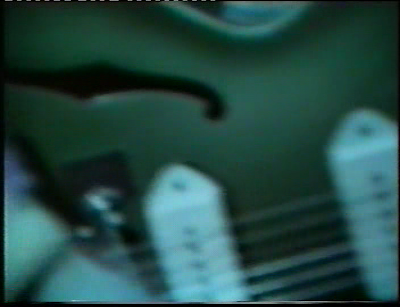 These tuners were used on Rickenbackers for a very short transitional period, and are fairly rare. 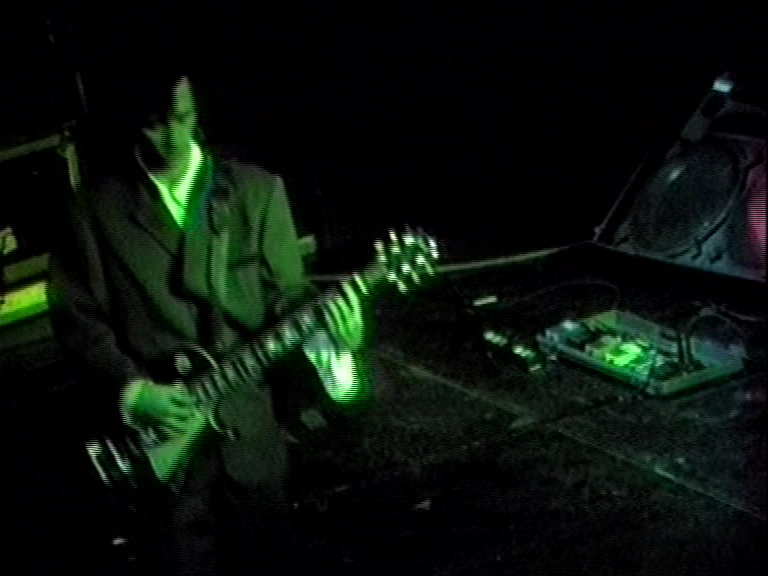 The [Headmaster Ritual] main riff is two tracks of Rickenbacker. I wasn't specifically thinking of the Beatles' "Day Tripper"--even though it sounds like it-- but I did think of it as a George Harrison part. 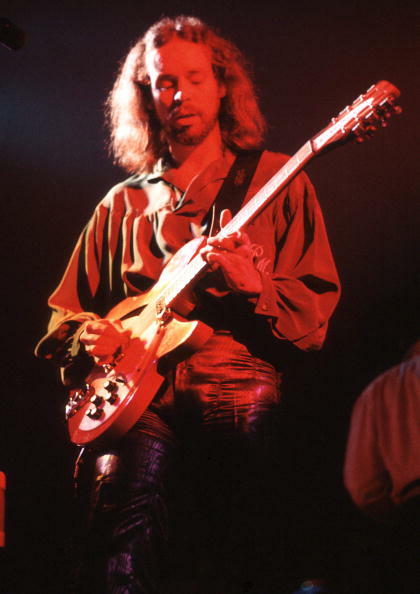 The Rickenbacker belonged to Phil Manzanera of Roxy Music; I'm told that it was originally owned by Roger McGuinn. There is no visual record of this guitar being played live. 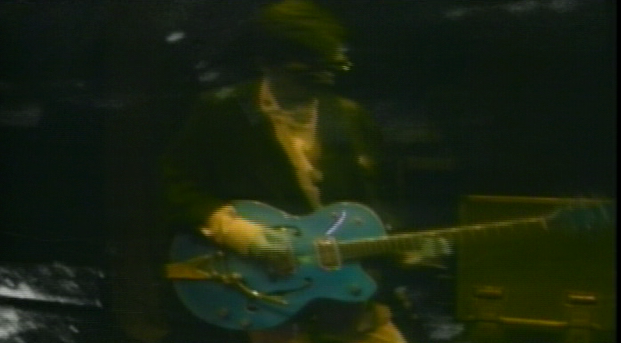 It was seen onstage as the backup guitar during the Derby show but was not used. 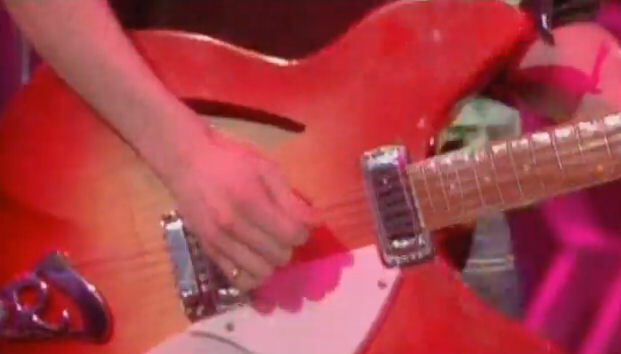 Note the binding on the fretboard; Rickenbacker 330's never have bound fingerboards. Also this guitar has an irregular scale, seeming to have only 20 frets instead of 21. 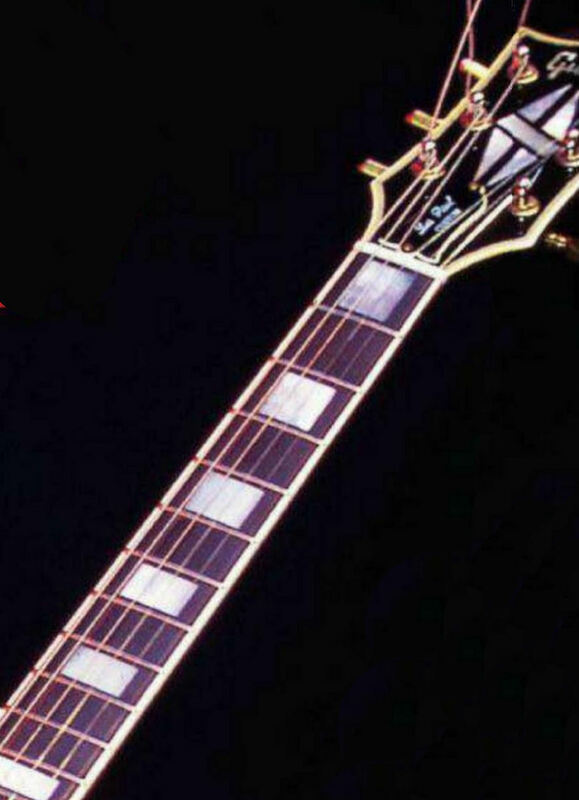 These two features would indicate that the fretboard was replaced at some point. These unusual features are present on Johnny's guitar as well as Manzanera's, confirming they are the same instrument. I have not yet found any evidence showing Roger McGuinn using this guitar... if anyone has any more info, please contact me. My 1964 Rickenbacker 12 String that once belonged to Pete Townsend. 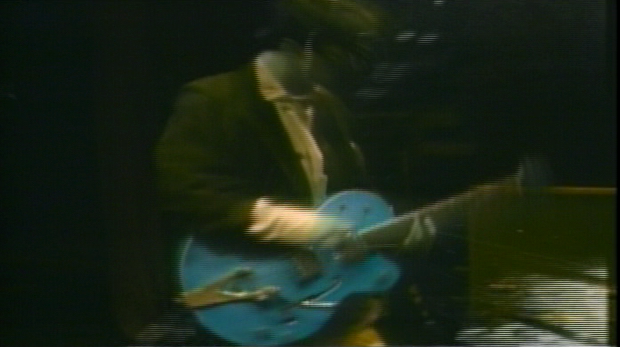 Used on most Smiths from 'This Charming Man' onwards. 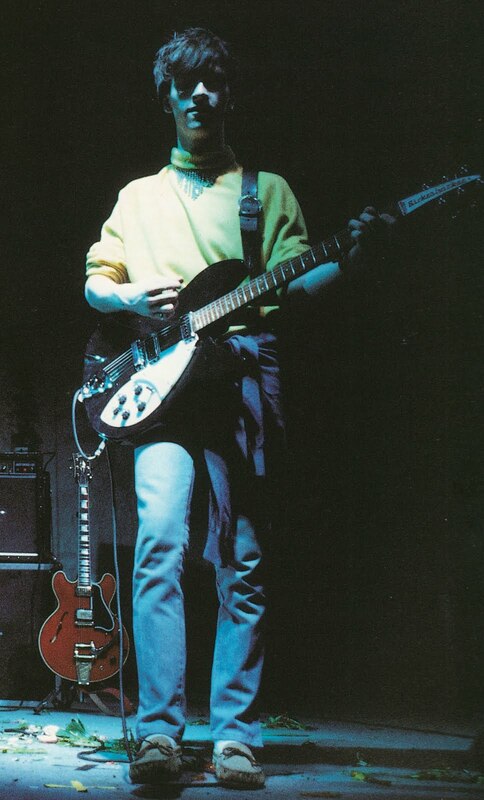 The 360/12 I've got is one of Townshend's only original ones he didn't smash. It's great. 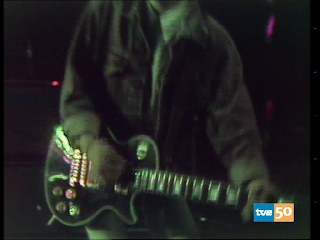 This guitar was used live at the Hammersmith Palais show, March 12, 1984, as well as the following night's show at the Free Trade Hall. Johnny has said that it belonged to John Porter and had been loaned to him. 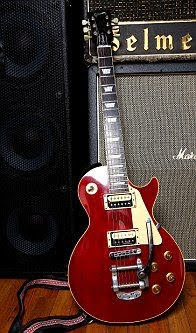 It's distinguishing features are the two white, uncovered humbuckers and the absence of a ring around the pickup selector. It also seems to be a sunburst finish. 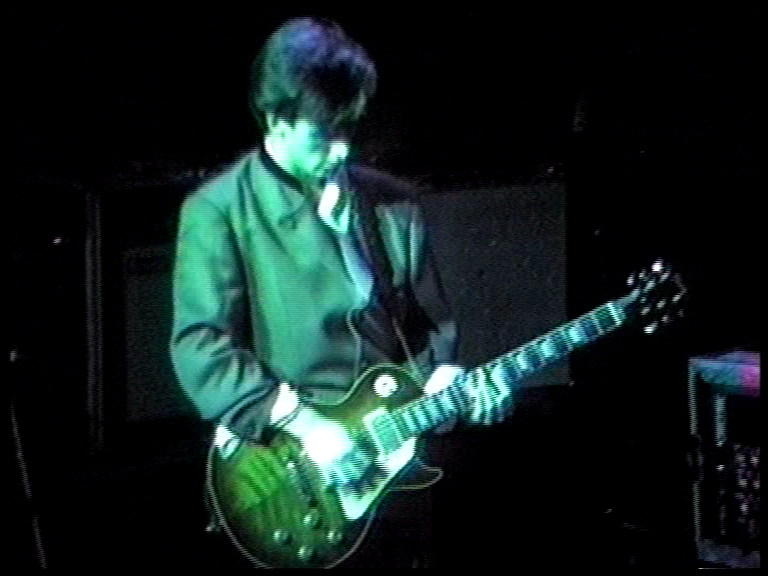 These are the first known appearances of a Les Paul at any Smith's show. 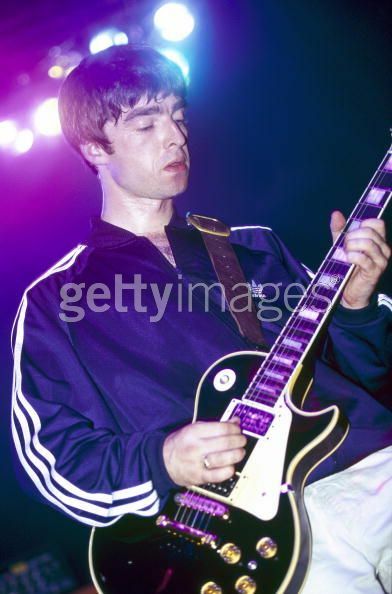 It is not known how many other shows he used this guitar at; one other confirmed show is the March 18th show at De Montfort Hall in Leicester. 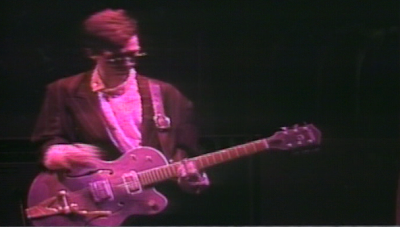 Here we can see the guitar in early 1985 before the Bigsby was installed. Bought for Meat Is Murder tour, also used on 'How Soon Is Now?'. My other Les Paul is a mid-'80s one with a Bigsby retro-fitted; that's the one I used on 'How Soon Is Now?'. 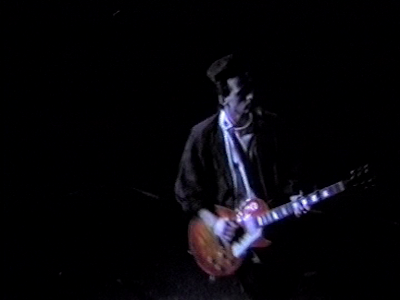 The Les Paul I used on the second Smiths album is the one I've still got now, the cherry one. I put a retro-fit Bigsby on it. I also put on Seymour Duncans and a coil tap. 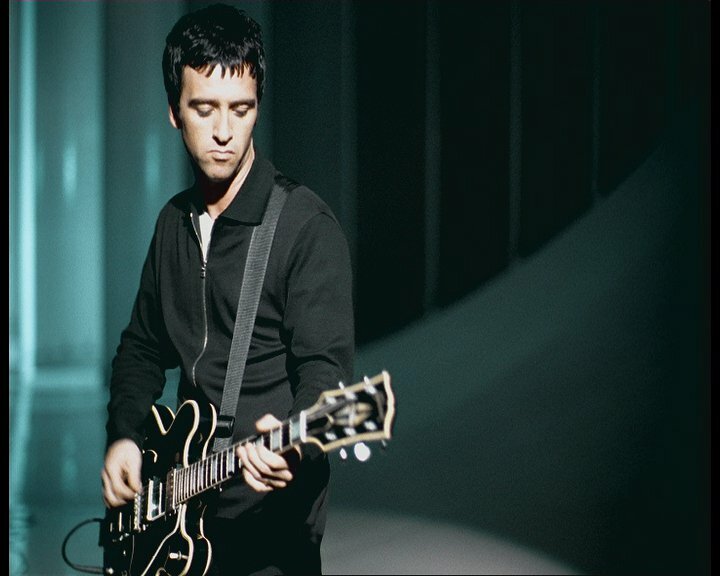 I was looking for a harder sound for the Meat Is Murder album, and I tried a few different guitars before coming around to the Les Paul. There are a lot of traditional rock cliches associated with this make of guitar, so I had to work past that. This was used to write Nowhere Fast, That Joke Isn't Funny Anymore and I Want The One I Can't Have. I used it to record The Headmaster Ritual. 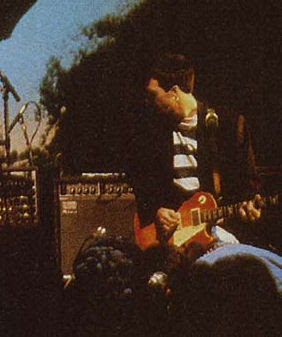 This was Johnny's first "main" Les Paul, which had it's first documented appearance on December 1, 1984 and it's last appearance was at the Smiths final show on December 12, 1986. There were periods where it saw less use, when the '72 Custom took over as Johnny's go-to Les Paul, but it was one of the 3 Les Paul's he regularly used on the final Smiths tour. 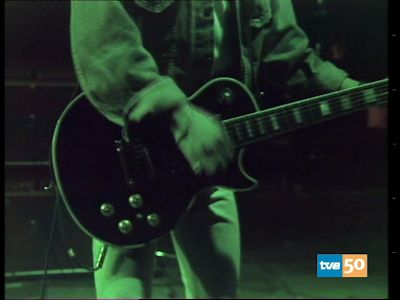 The Bigsby was installed in mid-March, 1985. 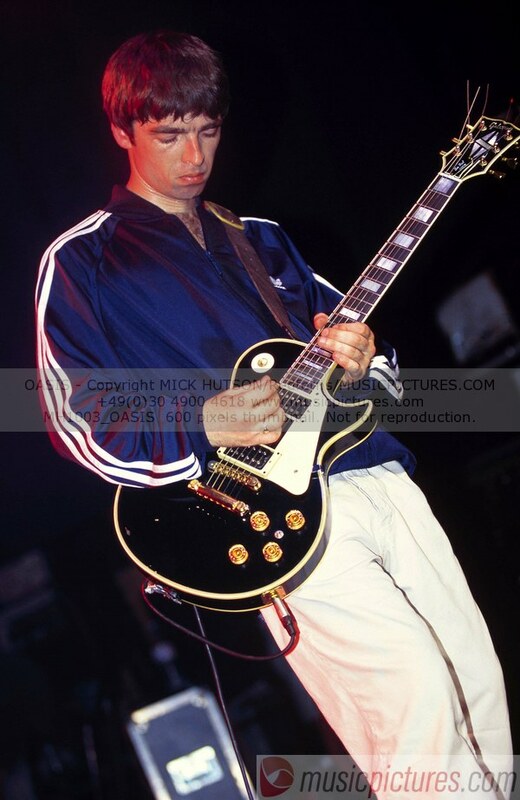 I've got this black Les Paul that I wrote Bigmouth Strikes Again on, and The Queen Is Dead... and it's on the whole of The Queen Is Dead, pretty much. 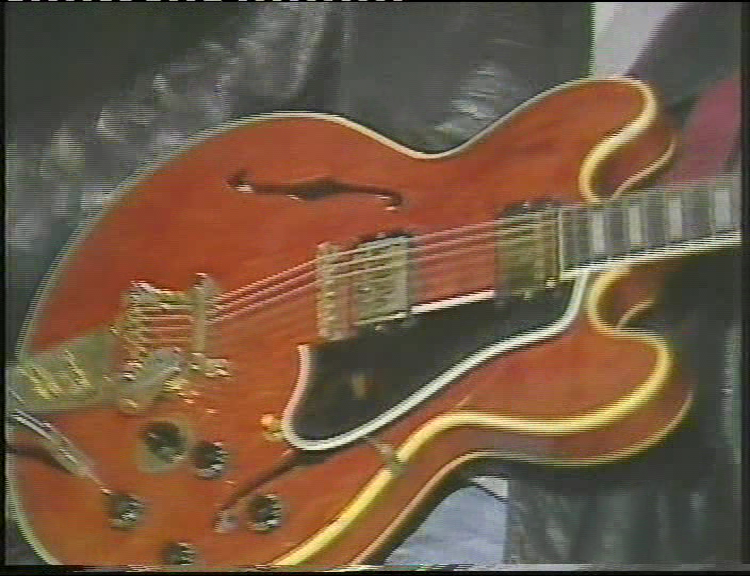 This was one of Johnny's main stage guitars in 1985. 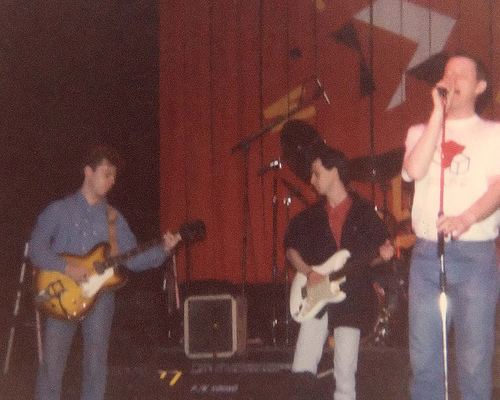 First documented live appearance was May 16th, 1985; final documented live appearance was October 15, 1986. 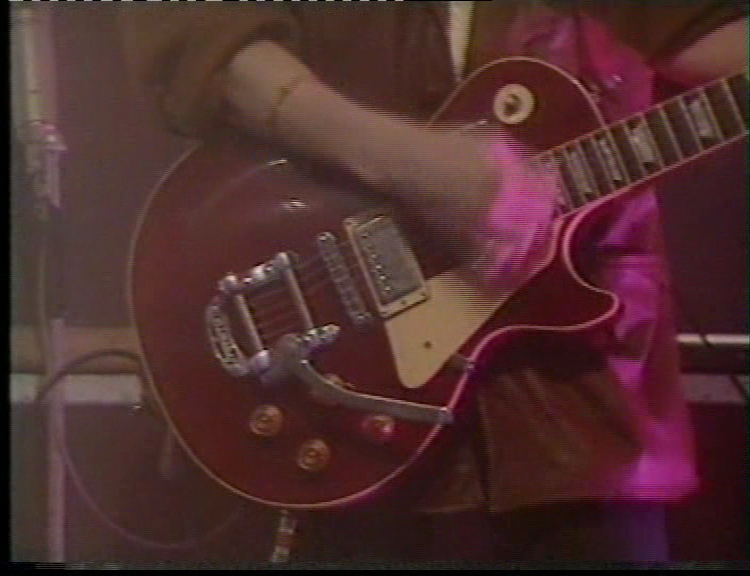 Note the mini toggle between the volume knobs, likely a coil tap. The tailpiece is a Gibson TP-6 with fine tuners. 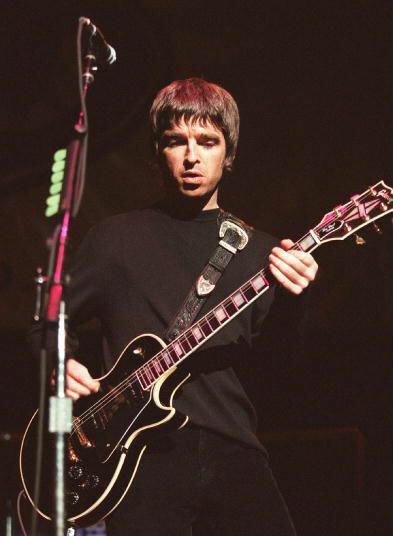 This guitar was given to Noel Gallagher(seen here, here and here) in 1994, who replaced the tailpiece and added a white pickguard. 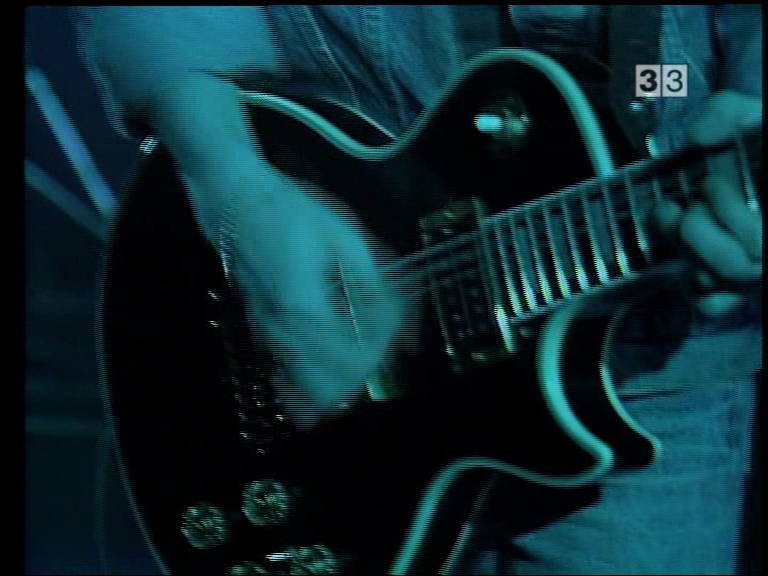 Noel [Gallagher] still has the Les Paul. It was a 1960 sunburst (refinished) that was given to Pete Townshend by Joe Walsh. The machine heads were replaced before I got it. I used it on "Panic" by The Smiths, also "London", "Ask" and "Half A Person". 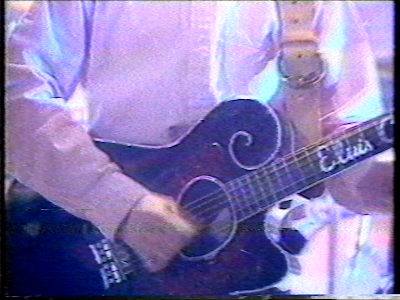 This was one of Johnny's main live guitars during 1986. 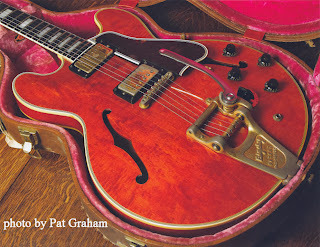 It has a very pronounced flame top, and more of a cherry finish than his '59 Les Paul. The bridge humbucker is uncovered with white/cream bobbins. This guitar was previously owned by Pete Townshend, and I'm assuming that it was in the group of guitars that Johnny bought from Alan Rogan. 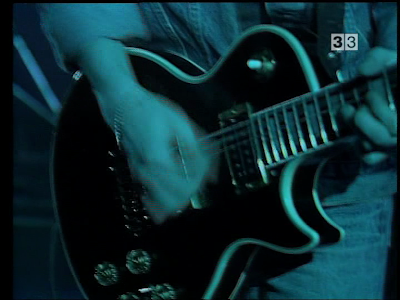 It was given to Noel Gallagher in 1994(seen here, here, here and here), it was used in the "Live Forever" video. 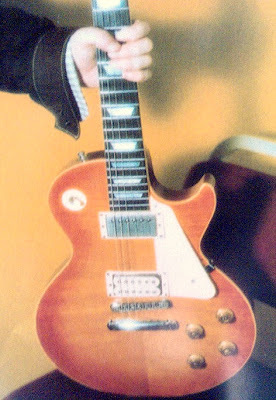 Noel broke the guitar during a stage fight, and was subsequently given Johnny's 1972 Les Paul Custom as a replacement. I used to use an ES335 with The Smiths for years, but now I've gone back to using just a couple of Strats and a '59 Les Paul. 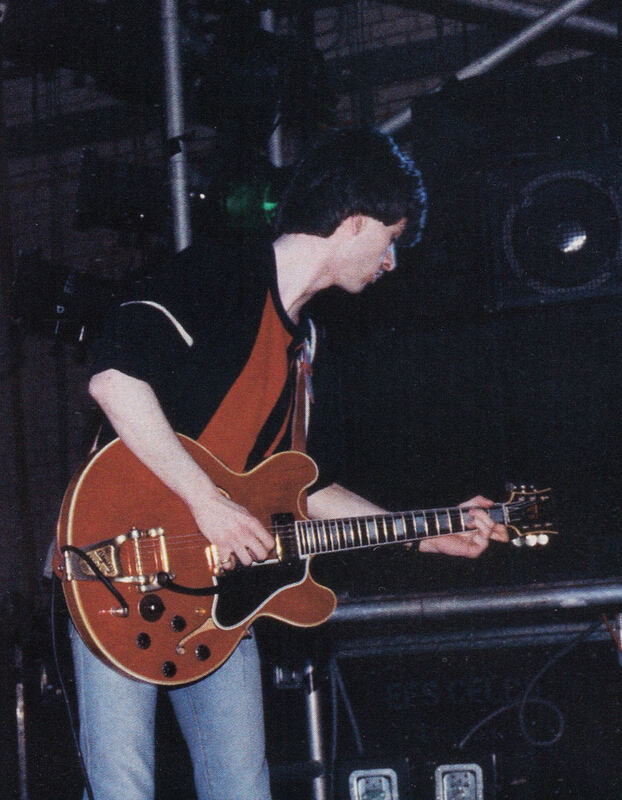 I've never seen any photos of Johnny playing this guitar live with the Smiths, but he very well may have. He did play it at the Mandela show with Simple Minds in 88, and there are some very good shots of it that clearly differentiate it from the other 'burst LP that Johnny used. 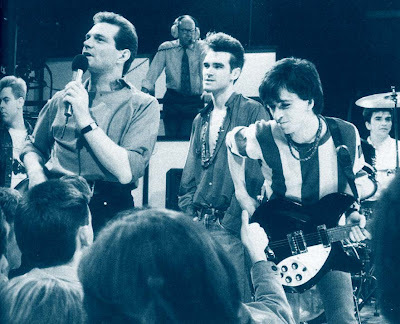 I met Sire Records boss Seymour Stein in late 1983 when the Smiths were about to sign to the legendary New York label. 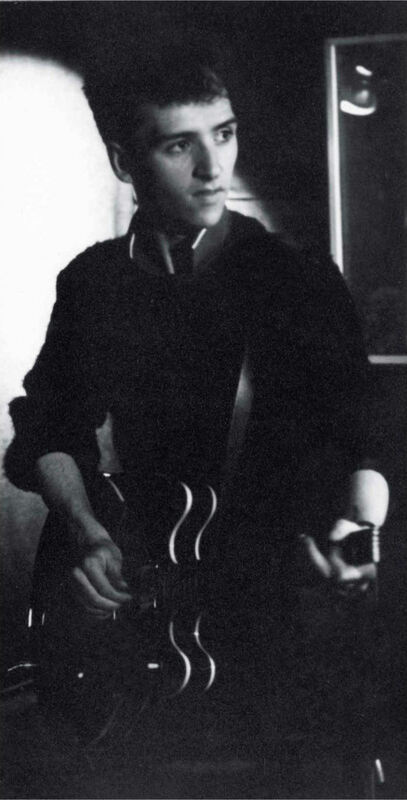 Seymour told me that he had once gone to a guitar store on 48th Street with Brian Jones to get him a guitar when the Rolling Stones were in town, so I suggested that if I signed with Sire he should buy me a guitar. 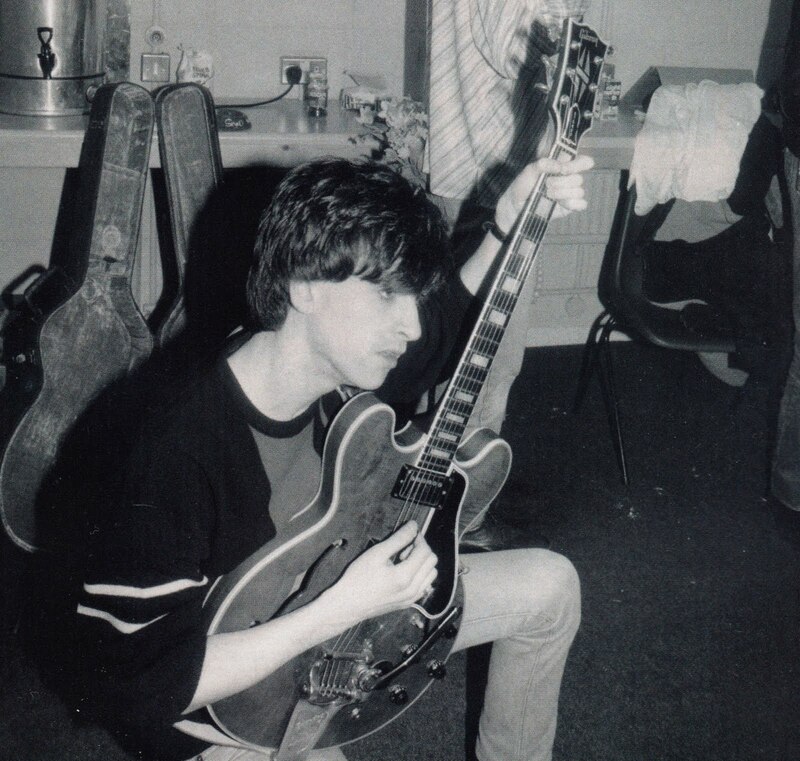 We signed the contract on January 2, 1984, and true to his word, Seymour took me down to We Buy Guitars on 48th and bought me the 1959 Gibson 355. 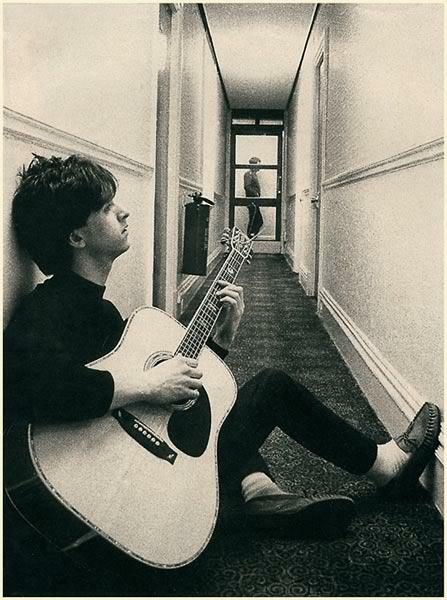 I took it back to the Iroquois Hotel and wrote "Heaven Knows I'm Miserable Now" and "Girl Afraid". It became my main guitar for quite a while, and I'm told it inspired Bernard Butler and Noel Gallagher to get buy one of their own. It's still one of my favorites. -Excerpt from Pat Graham's book Instrument, used with permission. 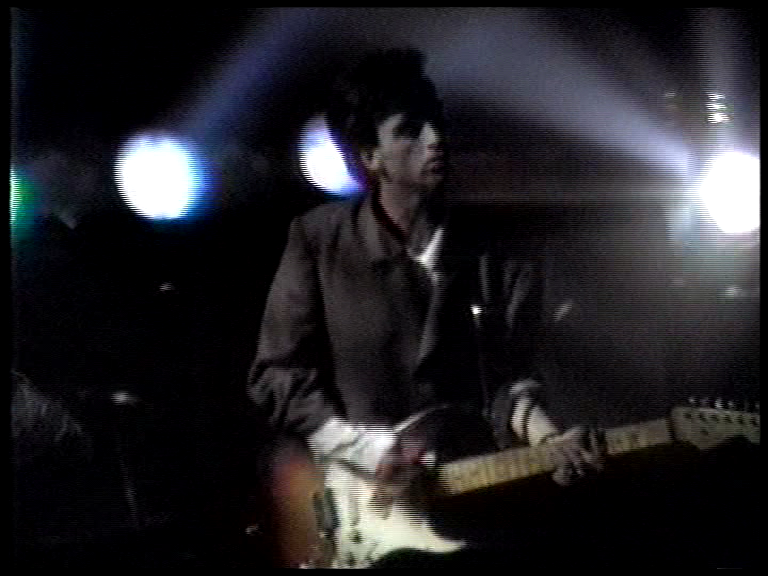 Used on Heaven Knows..., Nowhere Fast, and the 1984-5 Smiths tour. On the first tour I also ended up using the Gibson 355 quite a lot. As it was wired in stereo we just didn't have any power at all, so I got it re-wired and also put it through a Boss equaliser to give it some boost. 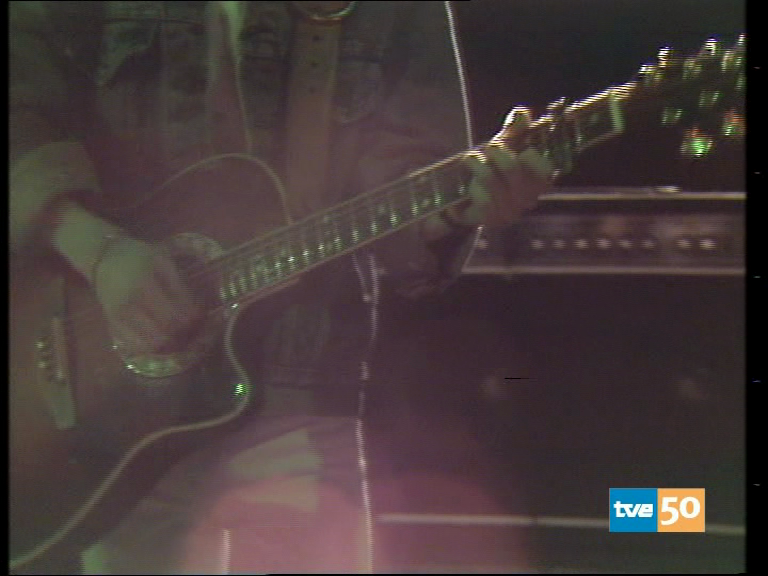 The first documented appearance of the guitar was January 26, 1984 on Top Of The Pops. It's last known documented appearance was Feburary 14, 1985 also on Top Of The Pops. 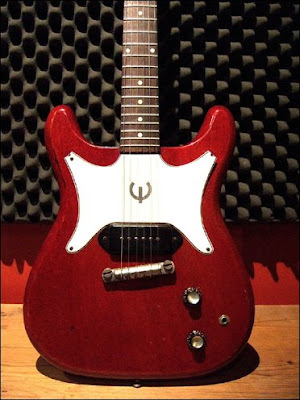 This guitar is fairly unusual. It's a custom color, and the bound F-holes, the lack of a varitone, and the switch on the lower horn would be custom ordered options. September 28, 1985, Clickimin Center soundcheck. 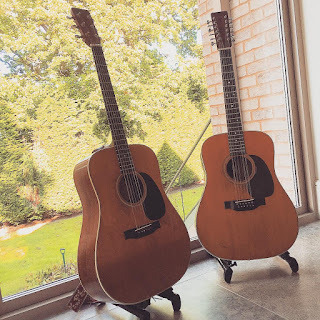 This ES355 has a Walnut finish, and is probably a late 60's-early 70's model. 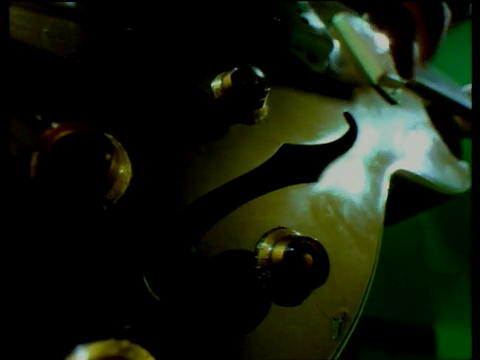 It has black uncovered humbuckers and a regular stop tailpiece. 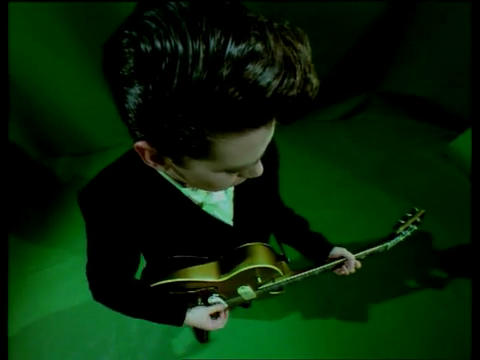 It can be seen for a split second sitting between Andy and Johnny in the Boy With The Thorn In His Side video. 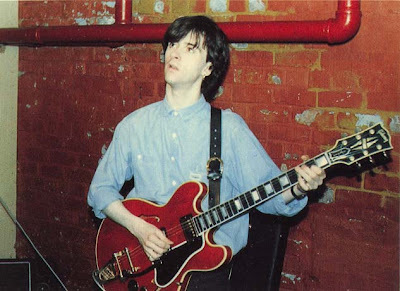 This is the Gibson 355(sic) that I first used on Sheila Take A Bow. I wrote and played I Started Something, Stop Me If You Think You’ve Heard This One Before and Death Of A Disco Dancer on this guitar. 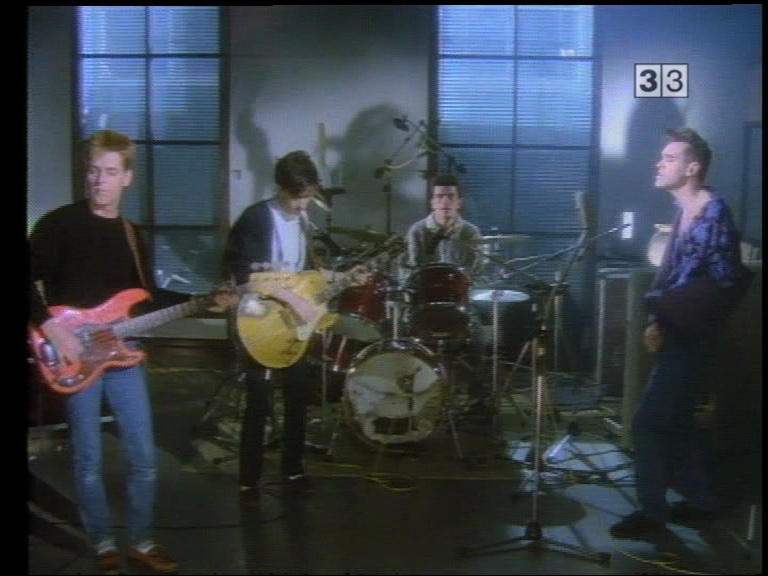 It can be heard on the start of Paint A Vulgar Picture, and on Nothing But Flowers by the Talking Heads, and seen on the The Smiths’ Top Of The Pops appearance for Sheila Take A Bow, and when we played on The Tube. 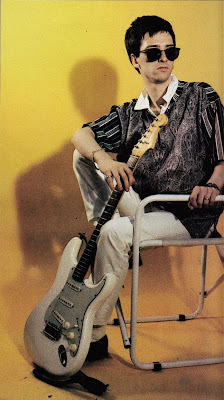 I wanted the electric guitar parts a lot less layered and with a lot more weight, which you can hear on 'I Started Something I Couldn't Finish'. 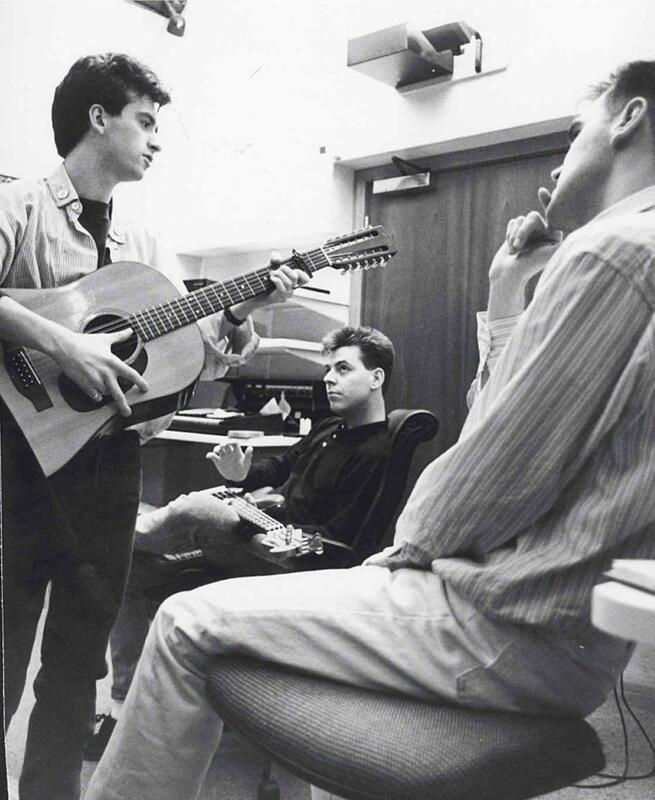 The stuff that wasn't acoustic was mainly led by my 355 12-string; in fact, a lot of the songs - 'I Started Something...', 'Paint A Vulgar Picture' and 'Stop Me If You've Heard This One Before' - were written on that guitar. It gave a really big sound. 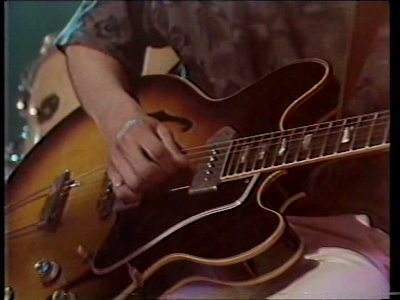 I've got a sunburst 12-string Gibson 335, the pickups are completely unbalanced - they're really cheap and nasty - but whenever I've DI'd it you get harmonics everywhere, and the sound is monstrous. 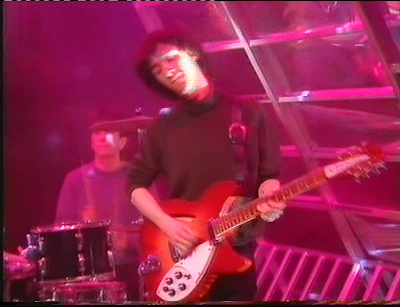 I've got another one, a red one, and that is a much finer instrument but it's too controlled. 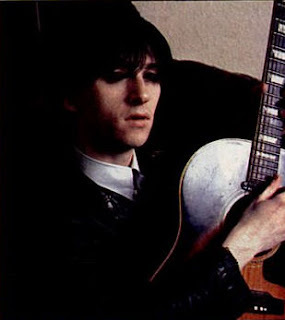 Johnny had three Gibson 335/12's with the Smiths: a red one, a black one, and this one. This guitar now belongs to Bernard Butler. Johnny in the "Boy With The Thorn In His Side" video. 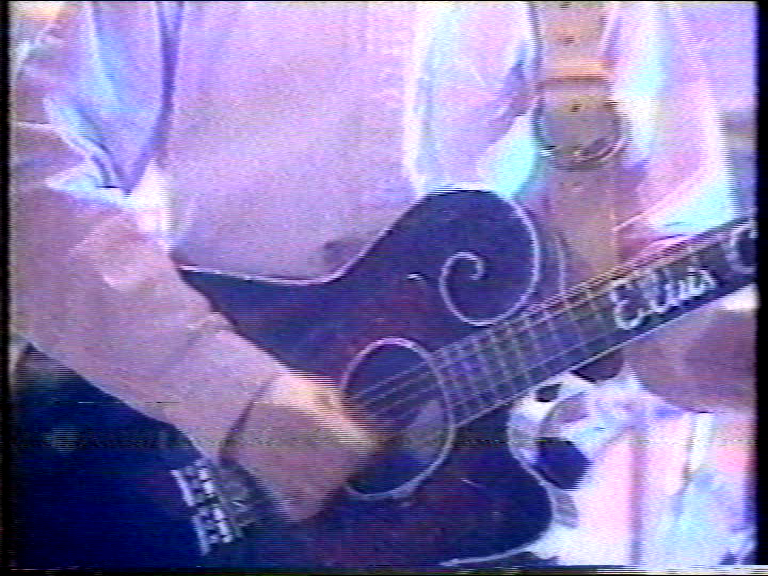 Note matching damage to top of guitar. 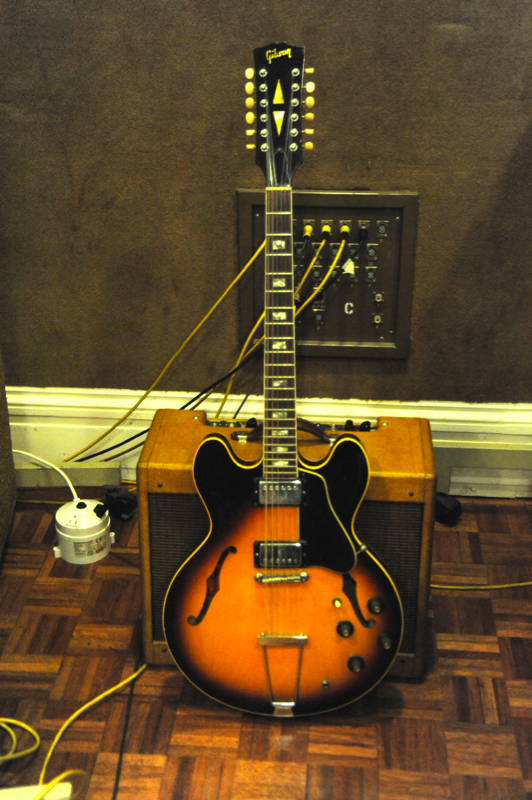 This is a 1954 Gibson 295 or "Scotty Moore" that I used in the video for 'The Boy With The Thorn In His Side' and on some of 'The Queen Is Dead' album. 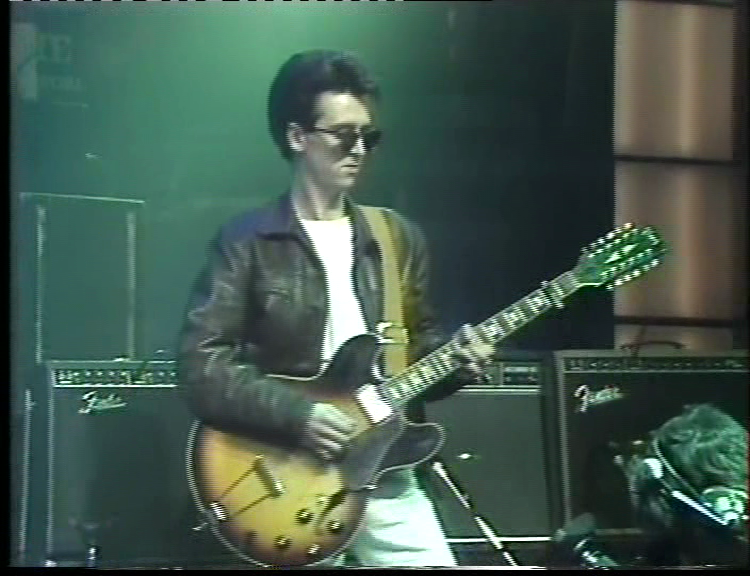 Craig had another Gibson 295 which was a guitar he used after he left the Smiths, notably in the "Last Of The Famous International Playboys" video. 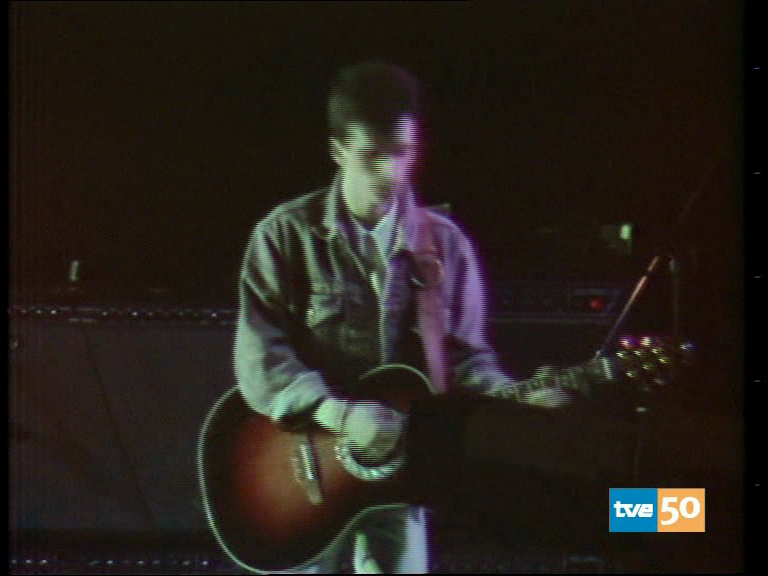 This was one of his main live guitars with the Smiths. Some of the distinguishing features of Craig's 295 are the wooden bridge base and a scratch on the top below the neck volume knob. 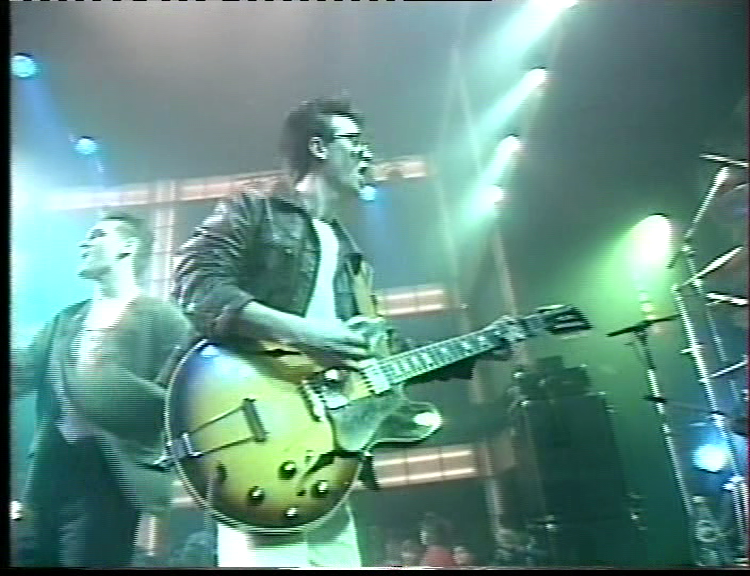 On a Top Of The Pops performance of "Heaven Knows I'm Miserable Now". 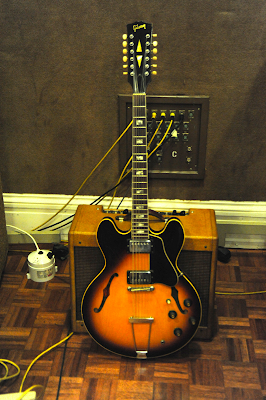 The 1963 Epiphone Casino that I used to record the main tremolo sound on 'How Soon Is Now'. I recording the rhythm part and then sent the track out to four Fender Twin Reverbs all with tremolo on and had to keep stopping the song when the amps went out of sync. It took quite a long time. 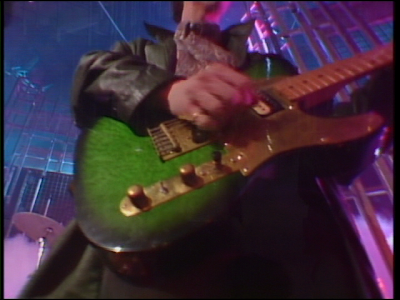 I wrote 'Nowhere Fast' on this guitar and played it at the Glastonbury Festival in 1984. 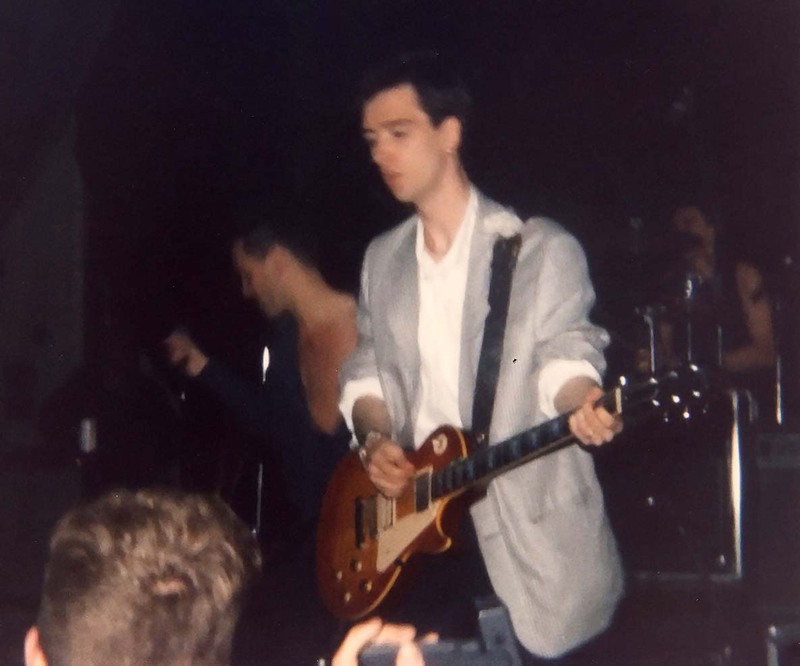 The picture on the inside of Hatful Of Hollow was taken in the dressing room before we went on stage so I have the guitar on in that picture. I've also got an old Epiphone Casino. That's one of my favorites. I shopped around for it because I saw a few of them with P90 pick-ups on. 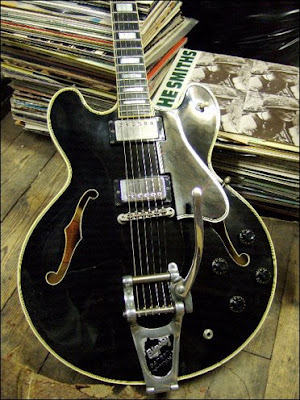 I knew I'd seen one with a Bigsby, but I didn't know where. 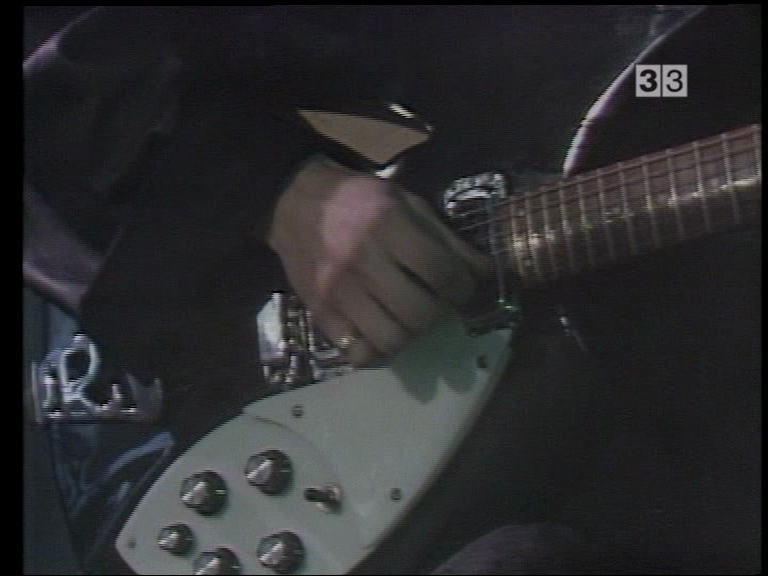 As it turned out I think it was Ray Davies who used to have a Bigsby on his instrument. 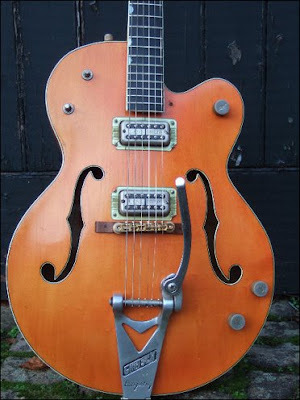 John Porter, our producer, advised me against getting one with a Bigsby on, because of tuning problems. It doesn't seem to be so bad on the Epiphone. 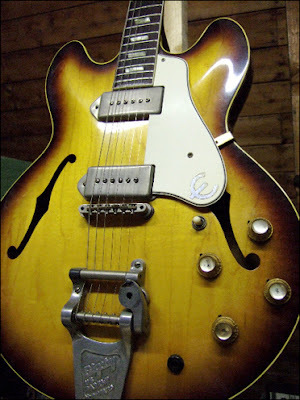 This is a 1962 Epiphone Coronet. Shortly after I got it I put it in 'Nashville Tuning', which means putting on an electric 12 string set (the bottom four strings are an octave higher than standard). It feels like your playing backwards because the higher strings are at the bottom. 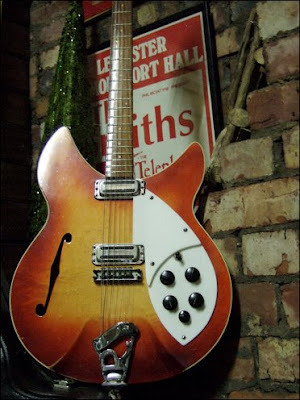 I used it to double a lot of the Rickenbacker arpeggios on Smiths records, most notably on 'William It Was Really Nothing', it's also the main guitar on 'Half A Person'. "I use Nashville tuning all the time. I've got an Epiphone Coronet with one pickup, and I string it with the high strings from a 12-string set. It's a really zingy, trebly guitar. 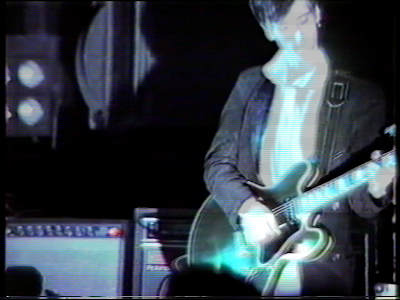 I used that on a lot of things that people think are 12-string, like the end of 'The Headmaster Ritual'. I also used it on the studio version of 'The Draize Train'. 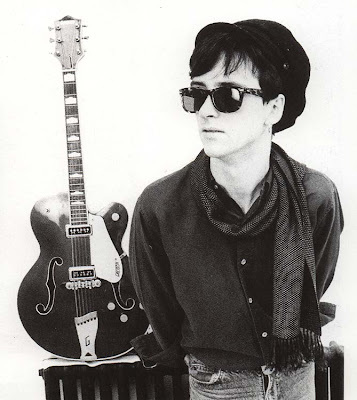 "This Charming Man" was the first record where I used those highlife-sounding runs in 3rds. 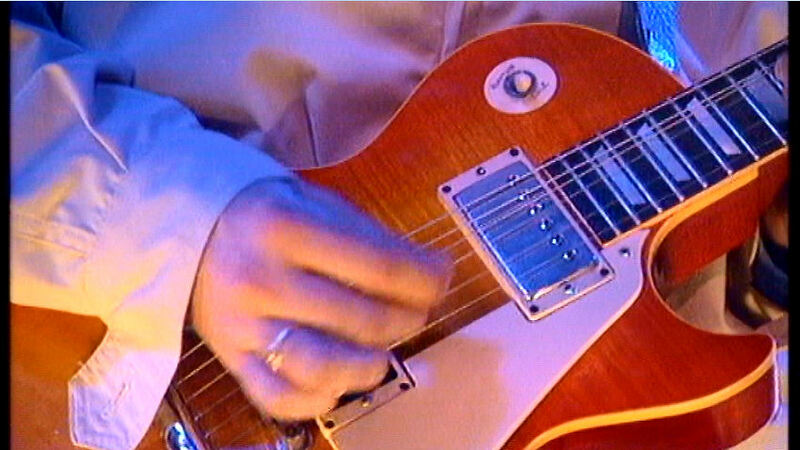 I'm tuned up to F# and I finger it in G, so it comes out in A. There are about 15 tracks of guitar. 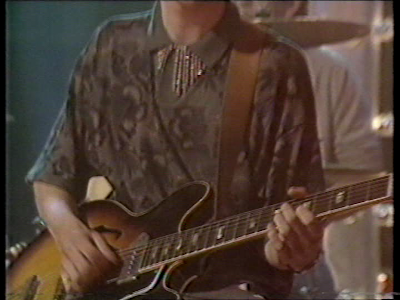 People thought the main guitar was a Rickenbacker, but it's really a '54 Tele. 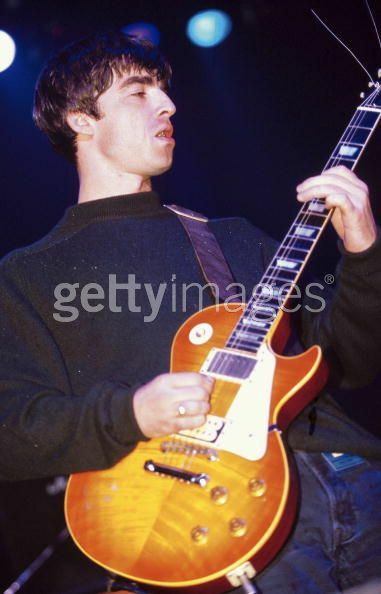 "I also have one that's a refinished guitar, back to butterscotch. It's a 1954 I got from an old friend Alan Rogan when all my guitars were stolen. It had a route for a humbucker, a couple of frets were missing, the pickguard was in pieces, and the nut had fallen out... I bought it for £17 and Roger [Giffin] refurbished it. 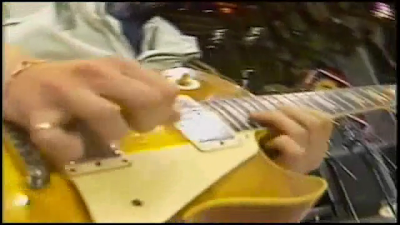 It became a fantastic guitar! When I was working with the Smiths, Johnny only had two guitars - a Rickenbacker and a Gretsch Super Chet, I believe. 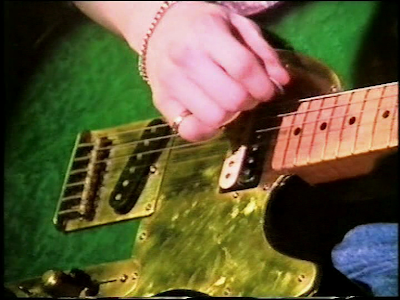 It was a bit limited; to my ear we needed a good Tele. I brought in the refin, and Johnny really loved it. 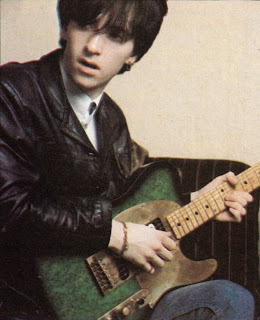 So every record I did with the Smiths, on every single song, most of the chiming Rickenbackers are in fact the Tele!" 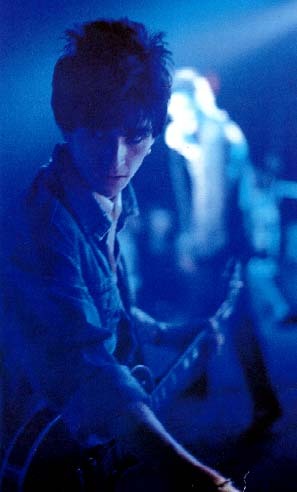 Used on Heaven Knows... and Strangeways Here We Come. I've got a Telecaster, made by Roger Giffin, which is a phenomenal guitar; it's in a dark-green sunburst. I have read rumours that this guitar was bought from Alan Rogan, who sold Johnny several of Pete Townsend's guitars. 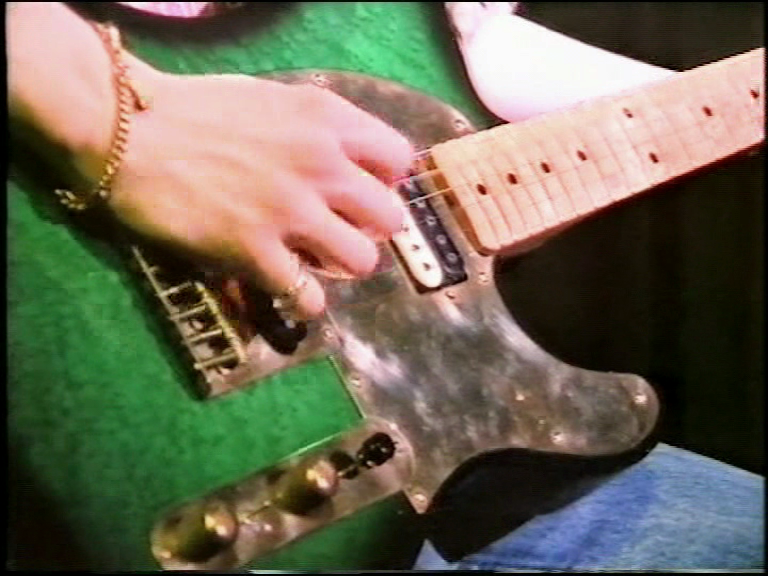 Roger Giffin made a lot of Tele's for Pete in the 80's. This guitar is pretty unique, though, and I have never seen Pete playing it. Note the mini-toggle switch between the volume and tone knobs, likely a coil-tap for the humbucker. 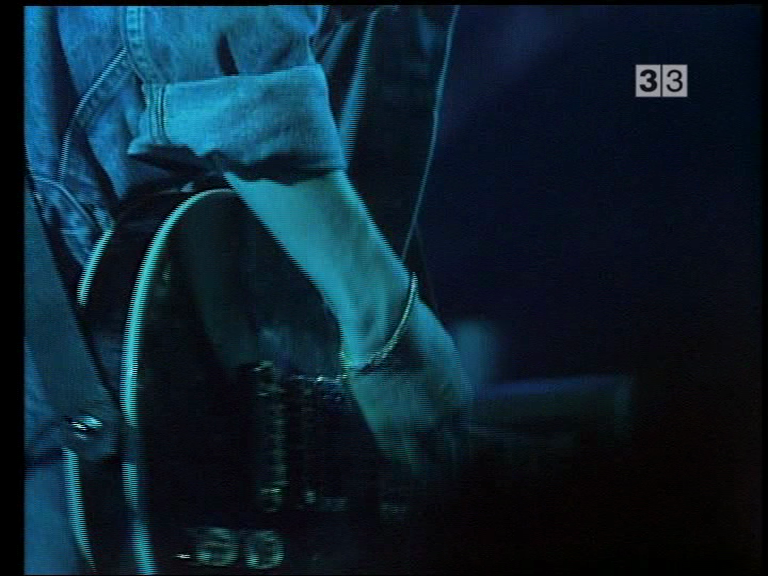 The humbucker looks like it could be a Super Distortion. In 1986, with maple neck. 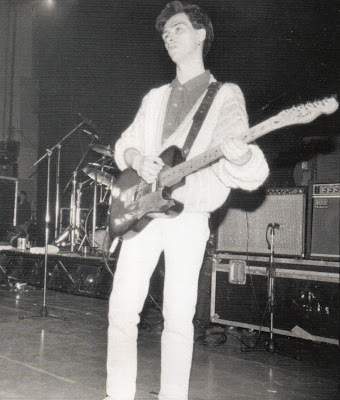 I used this Fender Strat on the Smiths US and UK tours of 1986. 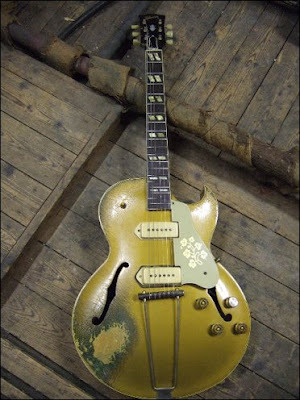 It is a 1962 body with a 1963 neck. I used it to record 'There Is A Light That Never Goes Out', 'I Know It's Over' and some others. 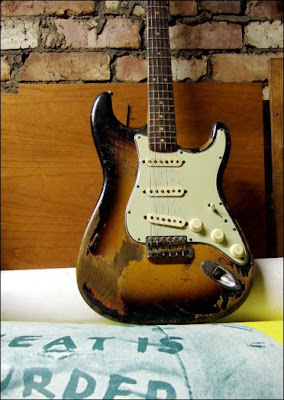 This Strat had a maple neck when it was used with the Smiths. It was one of Johnny's main guitars on the 1986 tours, and was used exclusively with a capo, for songs like "There Is A Light" and "Frankly, Mr. Shankly". It was very deliberate. 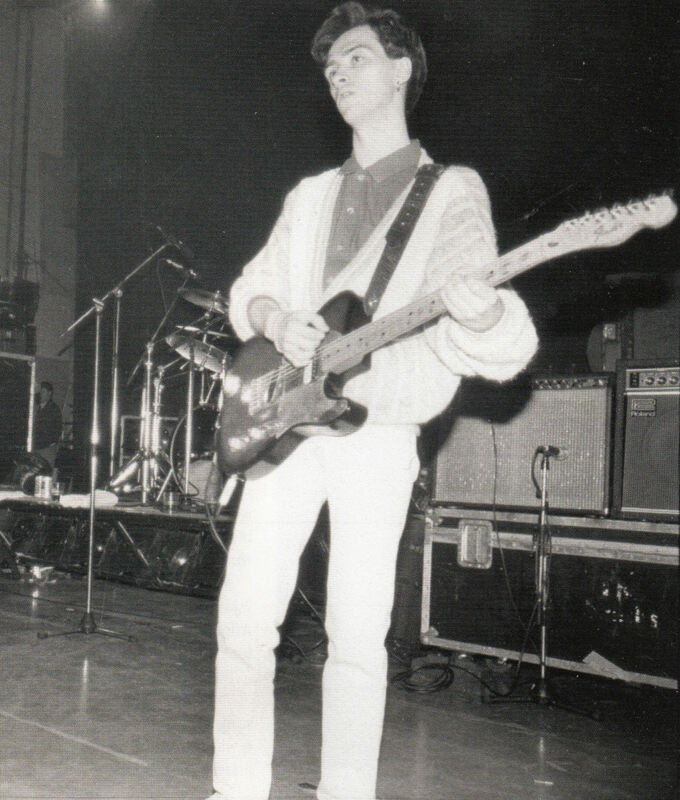 It was right when I got a white Strat. 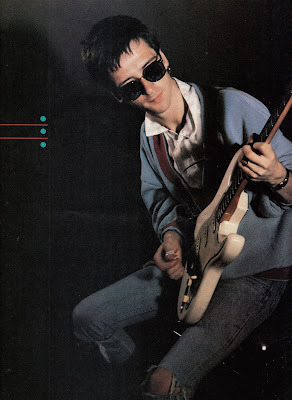 I used it on [Unloveable] and I used it on “A Boy with A Thorn in His Side.” But “Unloveable” was the first time I deliberately used that Strat sound for a Smiths song. I remember scratching my chin and thinking, Hmmm ok, Can I get away with this? You can particularly tell on that end. I used it on the outro of “Some Girls are Bigger than Others.” But “Unloveable” was the first of that whole row of songs. 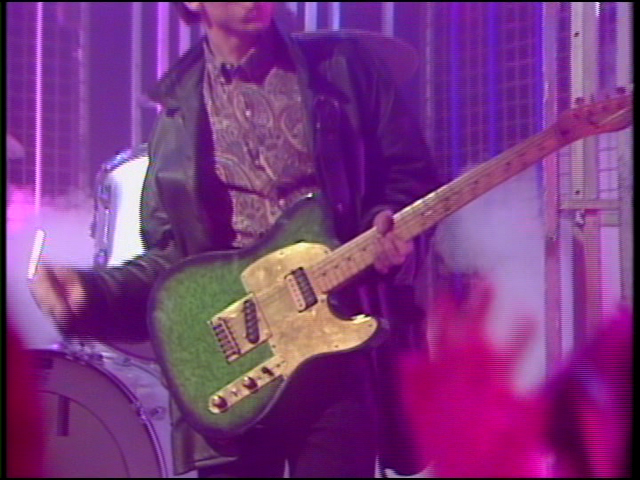 This Strat was first seen in the background when the Smiths were interviewed by Tony Wilson for Granada Reports on Feburary 21st, 1985. The following day Johnny used it for the Smiths' Oxford Road Show performance. 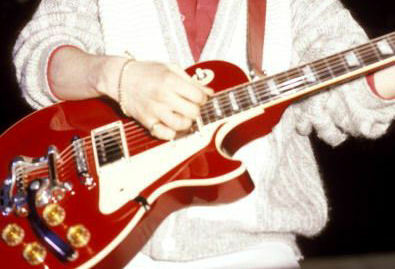 This was one of Johnny's main guitars on the 1986 tours. Johnny played it in standard tuning with no capo, while the '62 Strat was a dedicated capo guitar. 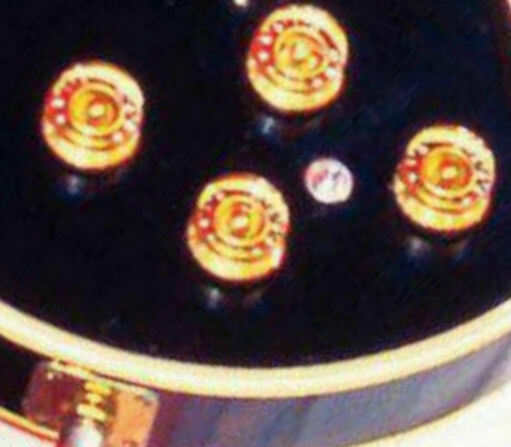 Here is a detail shot showing the customized electronics on this Strat. There is a second 3-way switch installed above the stock 3-way. 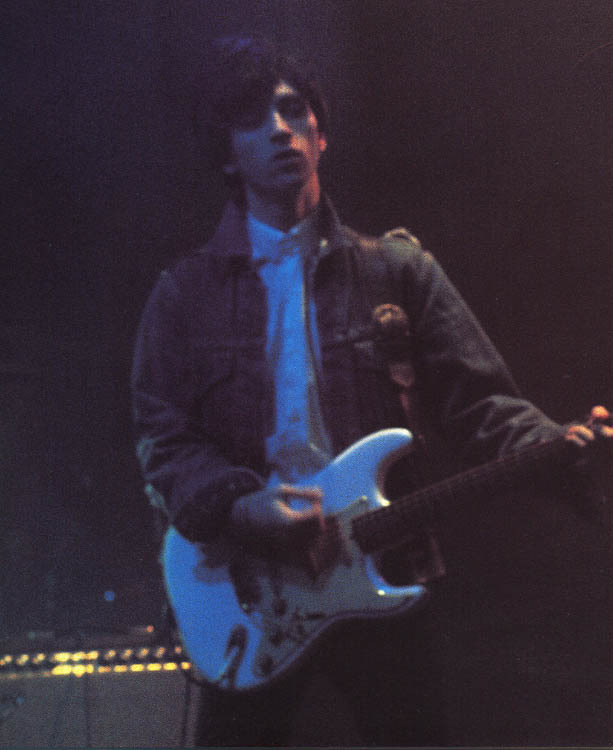 An identical mod can be seen in one of the post-Smiths Strat's, as seen here in 1987. 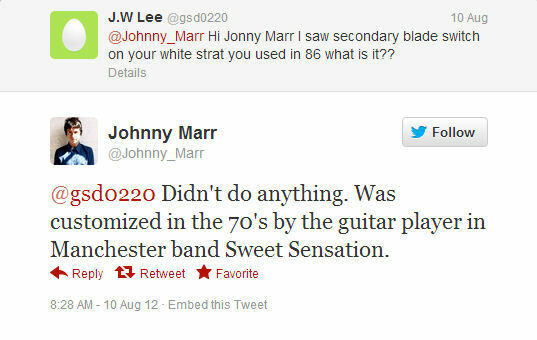 In 2012 Johnny revealed via this tweet that the modifications to this guitar had been performed by the previous owner, Gary Shaughnessey, the guitarist in Manchster soul group Sweet Sensation. 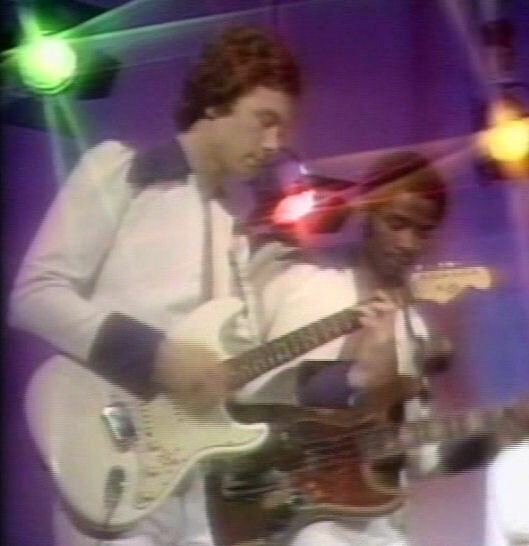 The group had a #1 hit in 1974 with "Sad Sweet Dreamer". 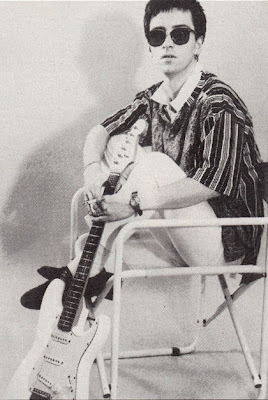 Seen in a photo shoot for the June 14th, 1986 Record Mirror. 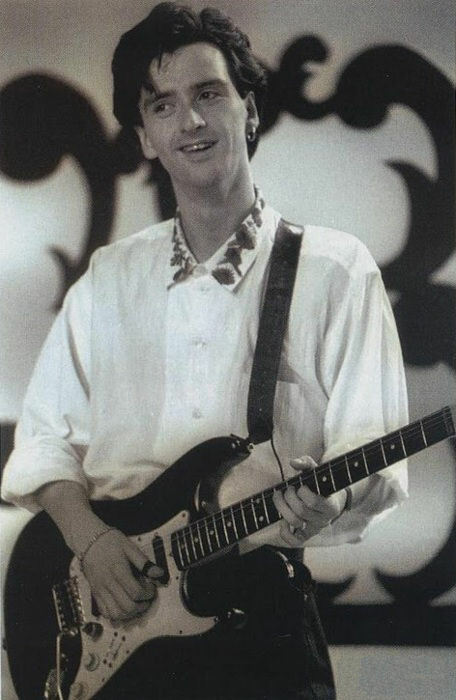 This seems to be another 1963 L-Series Strat like Johnny's other white Strat. This one is differentiated by it's standard switch layout and straplocks. These photos are from a Jo Novak photoshoot circa 1986. 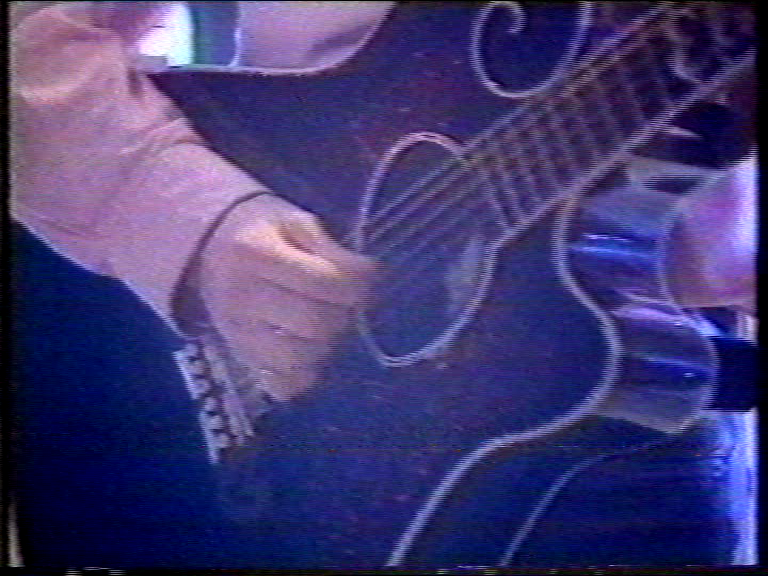 This is the only known appearance of this guitar. 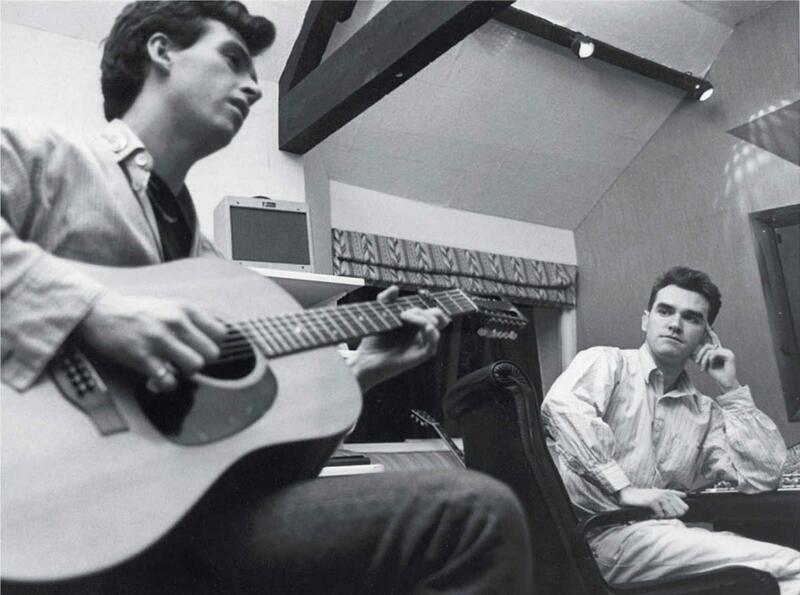 Smiths main acoustic. Martin D28. Well I Wonder, There Is A Light, Bigmouth Strikes Again, I Know It's Over. I wrote 'The Headmaster Ritual' on acoustic. It's in an open-D tuning with a capo at the 2nd fret. 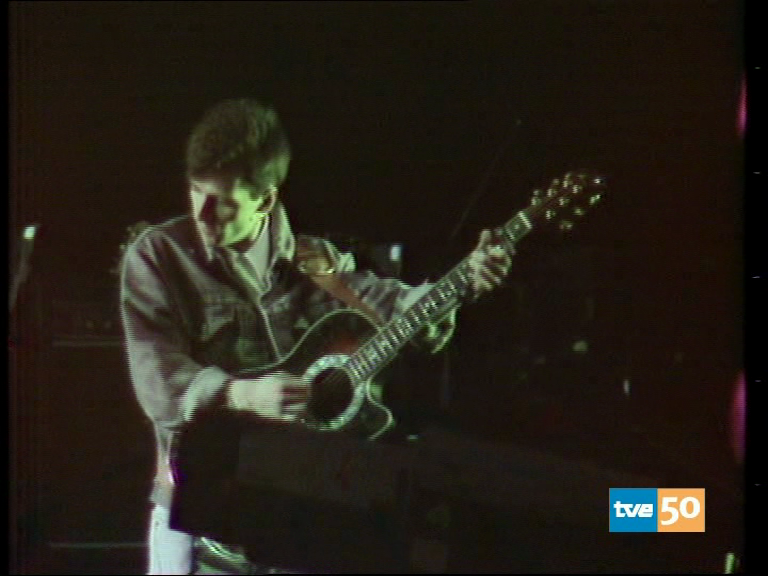 There are two tracks of Martin D28. 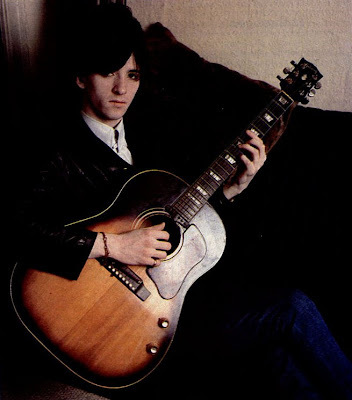 The Martin twelve string that I used on 'Unhappy Birthday' and 'Bigmouth Strikes Again' by The Smiths. Used on 'Back To The Old House'. I've had this guitar longer than any other. 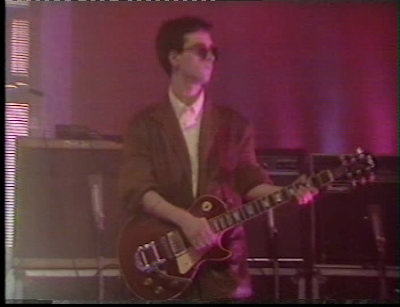 It cost me £900 in the early Eighties, which was a fortune back then. 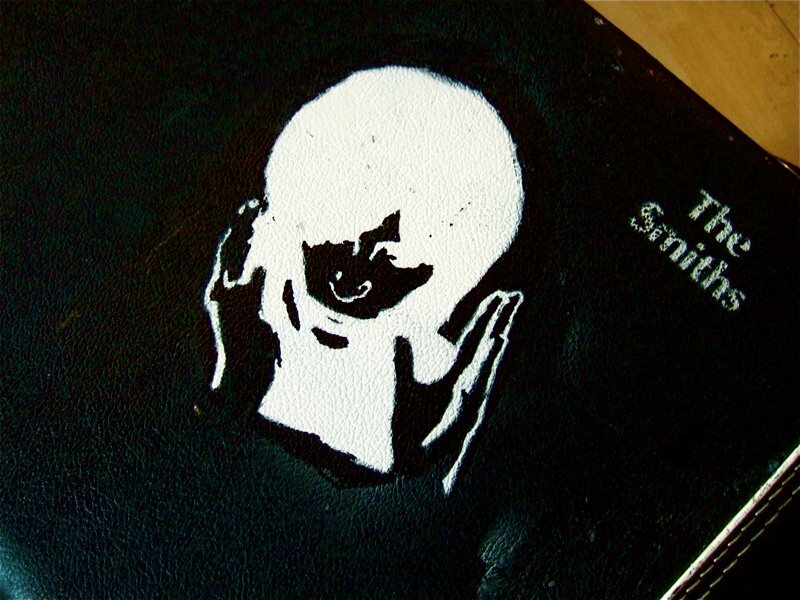 I wrote quite a few Smiths songs on this, including Well I Wonder and Cemetry Gates. These photos are from the Strangeways sessions. 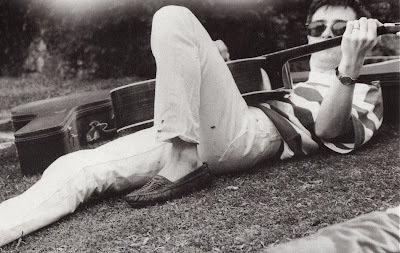 It's not known if this was Johnny's own Martin or just one at the studio. Nevern Square, Earls Court. William It Was Really Nothing, Please Please Please, How Soon Is Now writing session. 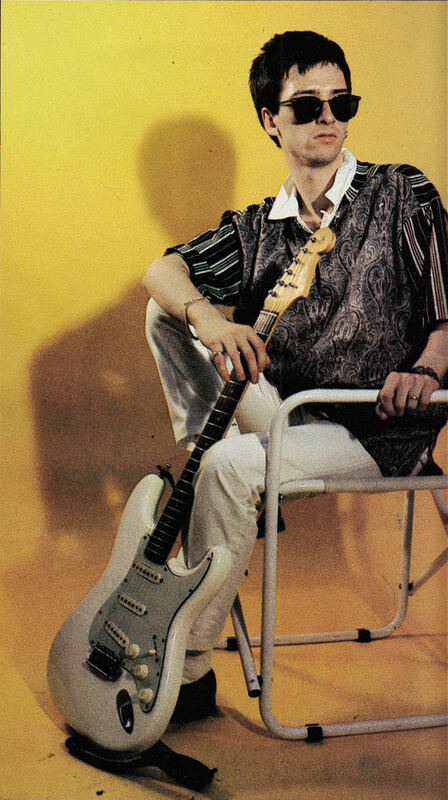 I got this J160 from Denmark Street when I moved to Earl's Court in 1984. 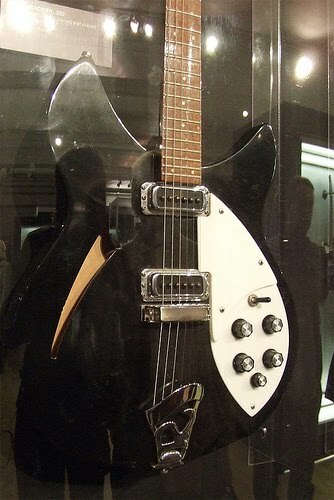 I wanted one because John Lennon used one on the early Beatle's albums and I liked 'I Should've Known Better' and 'I'll Be Back'. I wrote 'Please Please Please Let Me Get What I Want' on it and 'William It Was Really Nothing'. 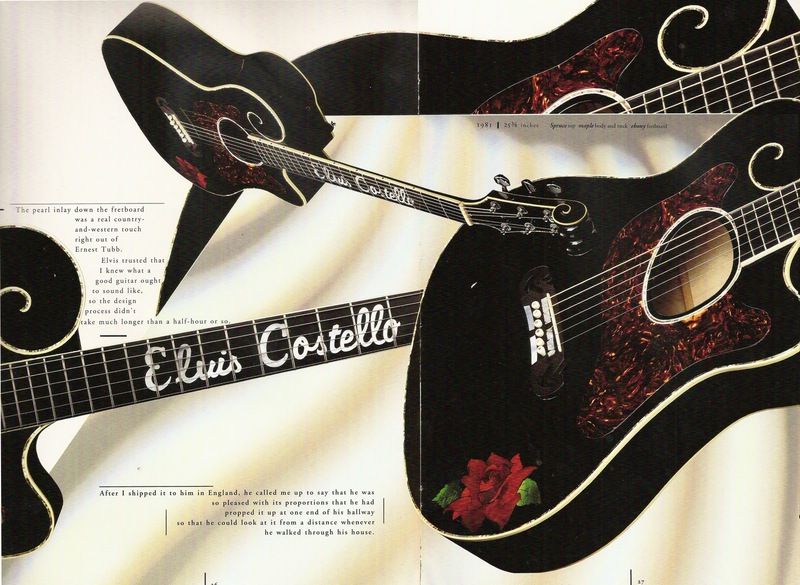 Custom guitar made by luthier Danny Ferrington for Elvis Costello, used on August 30th 1984 in a performance of "William, It Was Really Nothing" on Top Of The Pops. 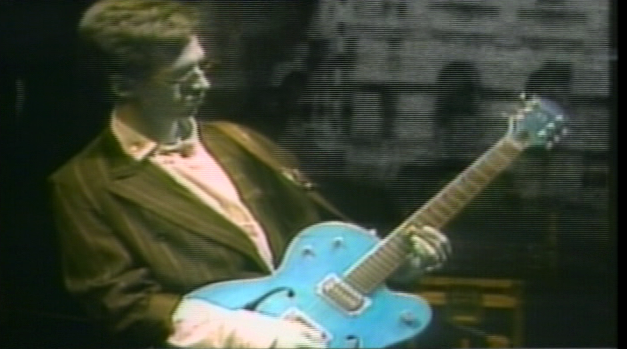 This guitar was apparently loaned to Johnny by Elvis for this performance. It was also used by Aztec Camera on another episode of TOTP, after which Roddy Frame had Ferrington make two guitars for him inspired by this Costello acoustic. I LOVE what you guys are doing with this site! 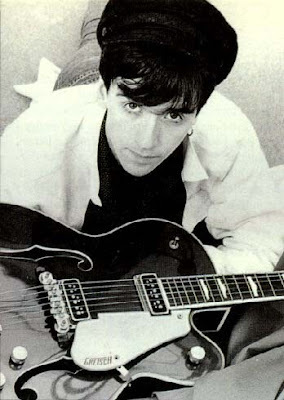 johnny marr is my hero and inspuration for playing guitar. and what about the strings ? "I use Ernie Ball strings, gauged .010 to .046, on most of my guitars." If you could only afford one guitar, in which you wanted to play smiths songs, which one would you choose? 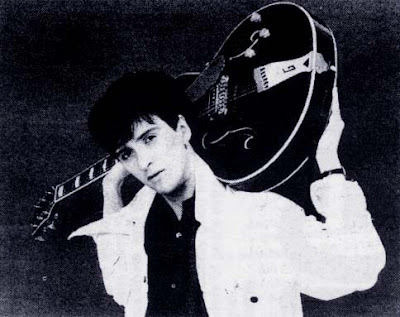 which is the most versatile for playing smiths songs? I'm thinking the Rickenbacker 330. Rickenbacker 330 or Gibson Les Paul, I would say. Depends on what era is your favorite. And... what are the effects Johnny used? Great site. Love it. But, how come nobody's got an "Is It really so strange cover?" i think he used a Boss/Roland chorus. Really so strange is up now. Its awesome how the 'Meat is Murder' album is conveniently next to the Gibson! Hey man great site. I was wondering though how Johnny ran the 4 fender twins with tremolo at the same time? How did he connect the 4 amps together to take his 1 guitar signal? I thought you could only use 1 amp at a time. 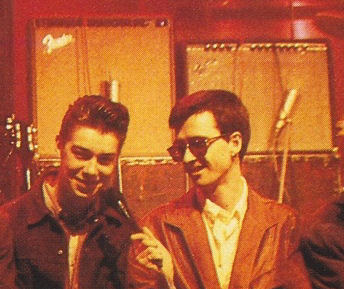 Dave, Johnny recorded the part clean, then played it back from the board into the studio. Then he sat with the 4 amps and they recorded it a little at a time, they had to stop whenever the tremelo got out of sync. buenisimo! hello! 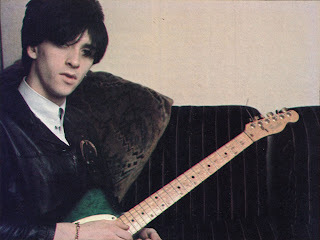 the site is great, very usefull and orde"ned" jajaj marr is the best hero on the guitar, is my main influence.. i'm argentine and i wanna learn play the guitar better than marr... that's impossible!! 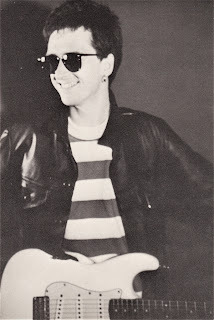 jajaj great blog, excellent, i'm searching for more material in score, marr technisism.. i'm glad.. goodbye! The most useful and addictive blog ever. Thanks for the comment, Silenced Chaos. I really appreciate it! What a great guitar designs, these guitar has been in the hands of good and successful guitarist. Johnny Gear is a great guitarist, he is a master. The black Boss pedal on his board from the '86 is likely a Boss HM-2 as it was the only black Boss pedal in existence at the time. Whether or not he used it much is another question entirely, but based on its color, and the number of knobs, that's probably it. 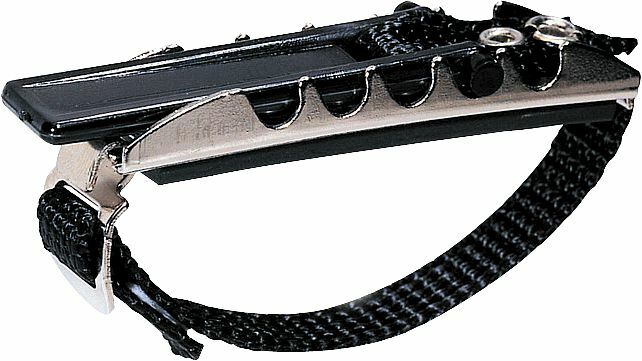 The SG-1 slow gear pedal was also black, and could have been purchased at the time. I can't imagine him using a heavy metal boss pedal, but it's possible I suppose! the unknown Gretch is 6196 Country Club, additional model 6196t comes with a bigsby, plays as good as it looks. The Slow Gear has 2 knobs (big ones, old Boss knobs style). This looks more like a HM-2. A minor correction: there's a pic of a black Rickenbacker in the section about the Epiphone Casino. I just can't see Johnny using the HM-2. You are right about the knobs, though. It's possible that it could be the BF-2, it's a dark purple and the stage lighting is really weird. Also JM remembers having it on his board. 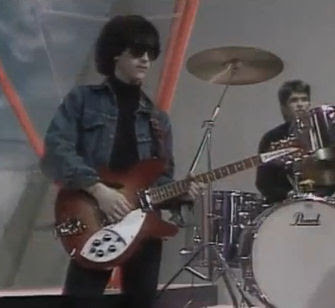 The black Rickenbacker is not a mistake, you can see the Casino in the stand in the background. I used it because there are not a lot of photos of the Casino. the last guitar - the acoustic is a custom Danny Ferrington, built by Danny for Elvis Costello. has nothing to do with his later Kramer collaborations. 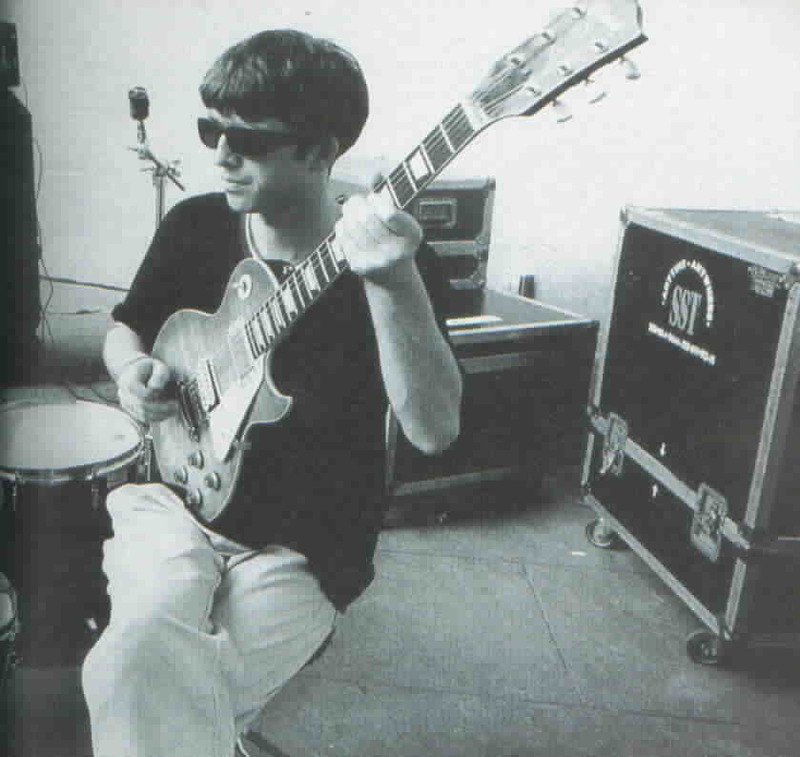 Detailed pics and info can be seen in Danny's coffee table book released in the early 90's. not sure how it ended up in JM's hands, perhaps given to him by Elvis? Thom, you've just written the Bible of Johnny's guitars. I be HE could learn something from everything you've documented here. Well done! The 1972 les paul custom, now belongs to Noel Gallagher, he changed the tailpiece to regular one replacing the TP6 and added a white pickguard. 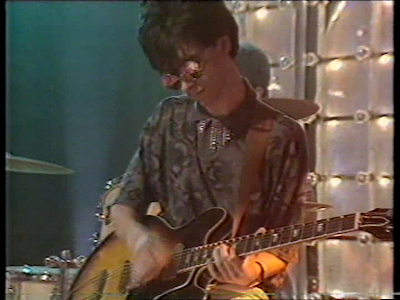 There's even a vid on youtube where Johnny tells how he borrowed it to Noel but he never gave it back. Thanks for that info Leandro, I will update the page to reflect that. Wonderful site! Thanks for putting this together. The Boss CE 1 is a must have for Johnny freaks. I use the chorus setting at around 8-9 o'clock. The effect is almost magical. Just recently got myself an old 1984 lead 100 vox amp. 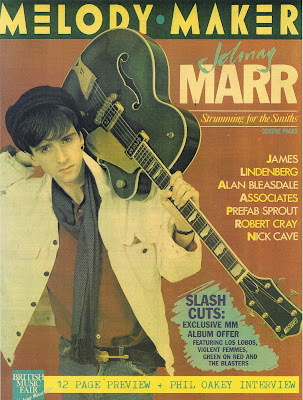 Am I right in saying that Marr used one in concert? and would it be worth something to someone? 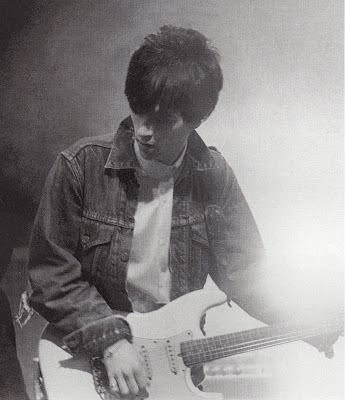 I once saw a guitar matching this description that (so I was told) had belonged to Johnny Marr. 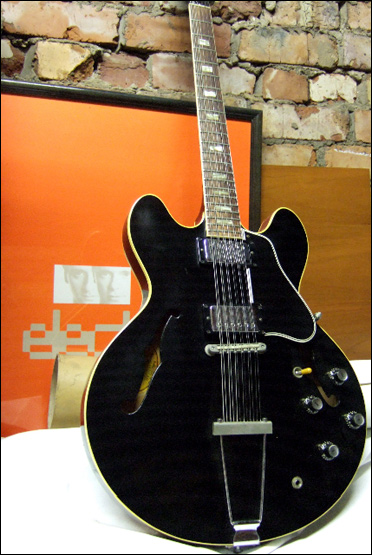 It was in the Collector's guitar shop in New King's Road. That would have been around 2000/2001, so after the eBay sale, I'm pretty sure. 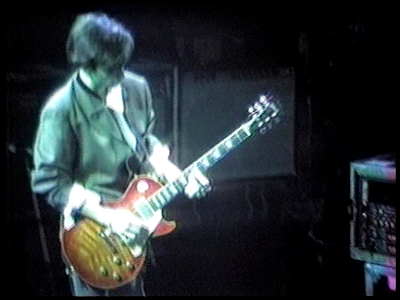 If memory serves, there were two similar guitars in the shop at that time - not sure if one or both were allegedly JMs. 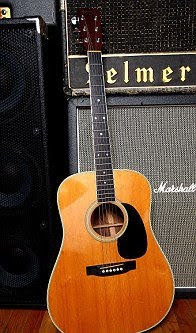 Quite possibly it was the same guitar featured here - they had a lot of beautiful instruments in at that time, including a 63 vintage walnut finish double cutaway Country Gentleman, from about the same period as that used by George Harrison on With the Beatles. So presumably, it's still out there somewhere - I'd be surprised if it hadn't been picked up by someone; just sadly not me! Great blog - thanks for creating such an invaluable resource. Will have a proper look around at the tabs etc. over the next few days. Hi Bob, thanks for your comment. 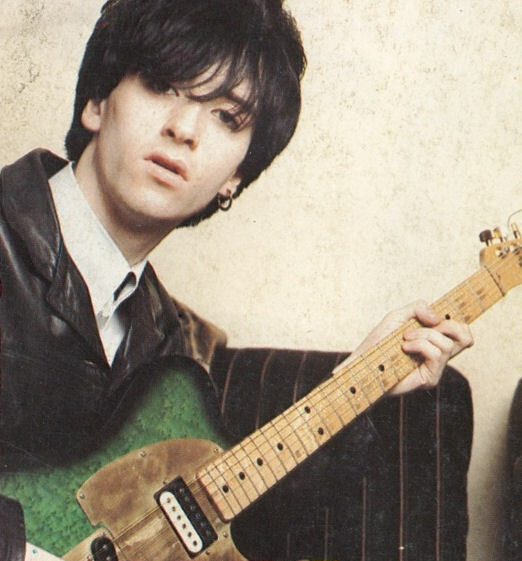 I have recently found out that this Green Gretsch was not one of Johnny's guitars, it was a loaner for the photoshoot apparently. I'll have to update the page to reflect that. It's possible that the one for sale in the shop, and the one on ebay, were this same photoshoot guitar... not Johnny's persay, but as-held by him. Are you playing in any of the youtube vids? 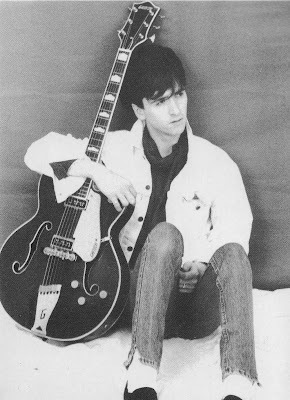 Johnny Marr is a guitar hoarder. Thank you so, so much for the time and effort you have put into this amazing site!!!! JM is just amazing, my hero!! Thanks Andy, glad you like the site. Excellent site - thanks for putting the effort in. A couple of things, Johnny has been using a G7th capo for the last few years. He usually uses his "upside down". Thanks for your comment, TheChief. Are you by any chance affiliated with Richard Henry? 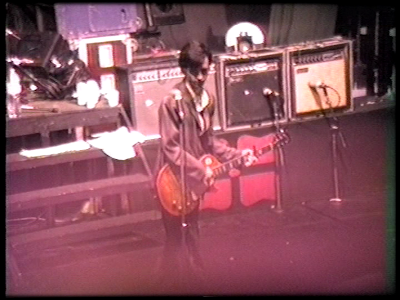 If so, email me, I'd love to ask a few questions about that Les Paul.